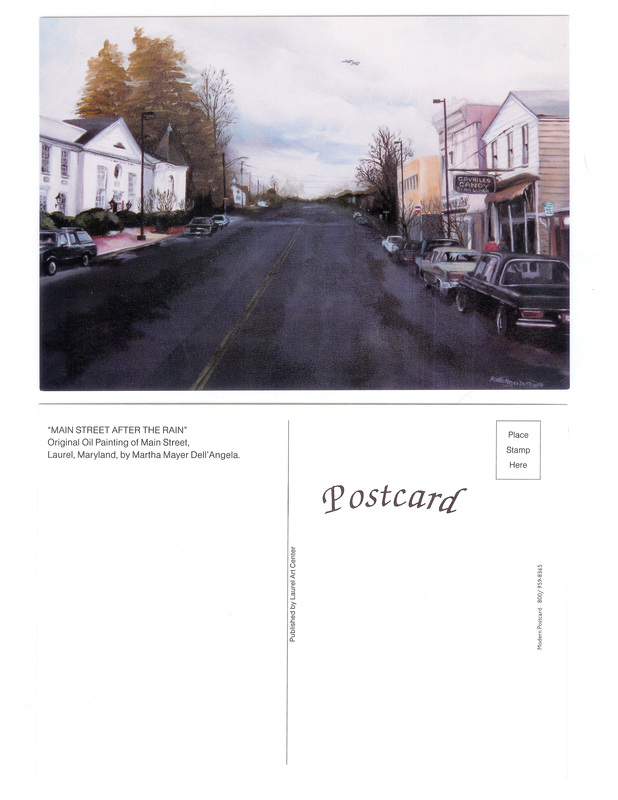 Racing… to close Laurel Railroad Station? 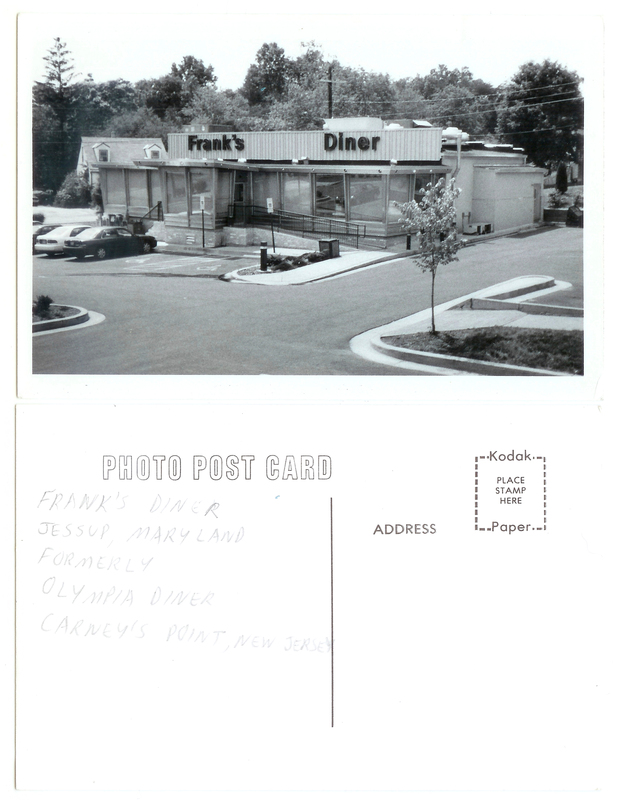 There’s a rather unlikely story in the local news this week—a head-scratcher, really. 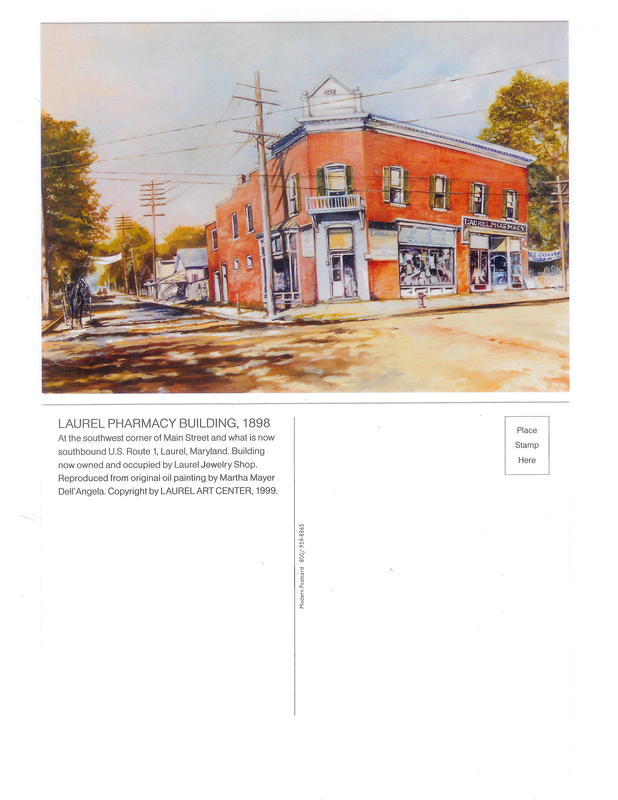 It concerns two of Laurel’s historic landmarks, and how they’re supposedly at odds all of a sudden. 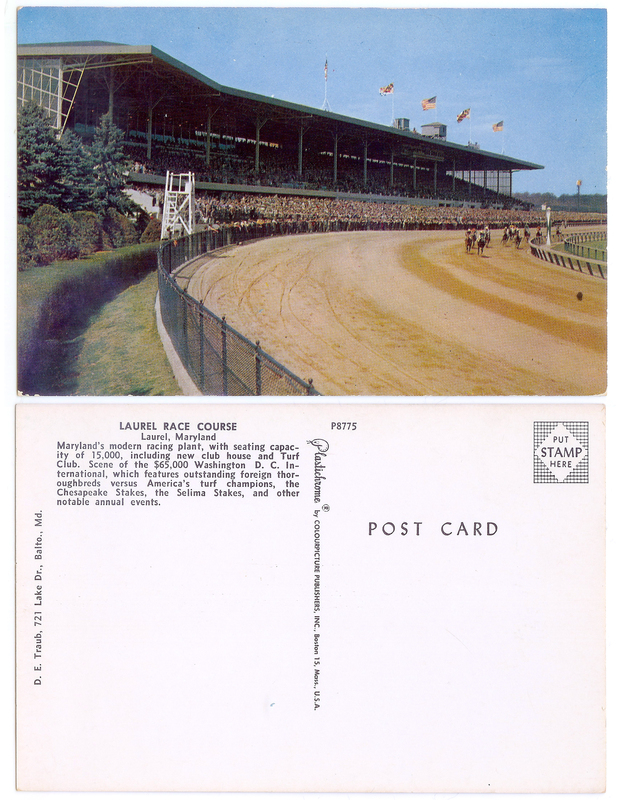 I’m speaking of Laurel Park Racecourse and the Laurel Railroad Station. 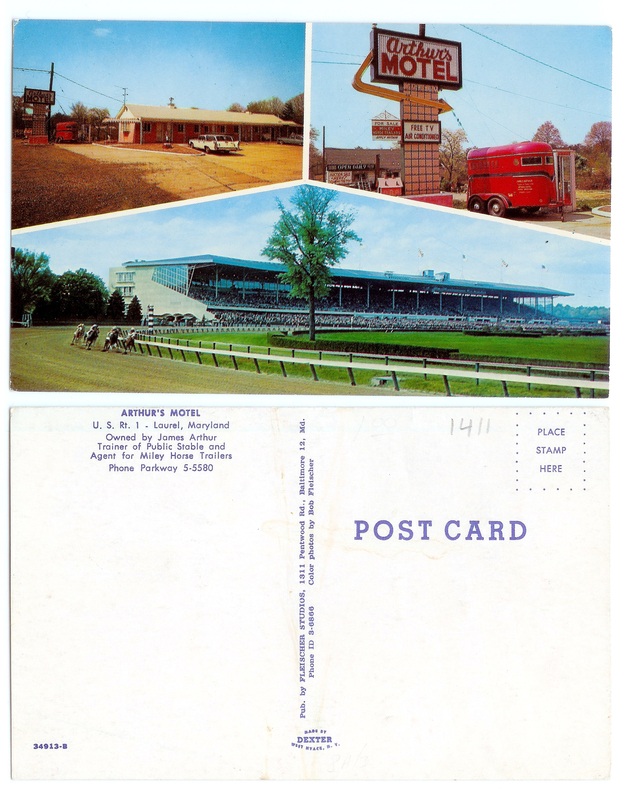 I’ll get right into it: Laurel Park, which after decades of hard times is finally seeking to turn the corner with an ambitious plan to build “a transit-oriented development with retail and residential space near the racetrack,” has requested the state Department of Transportation open a commuter train stop in Laurel closer to the track. 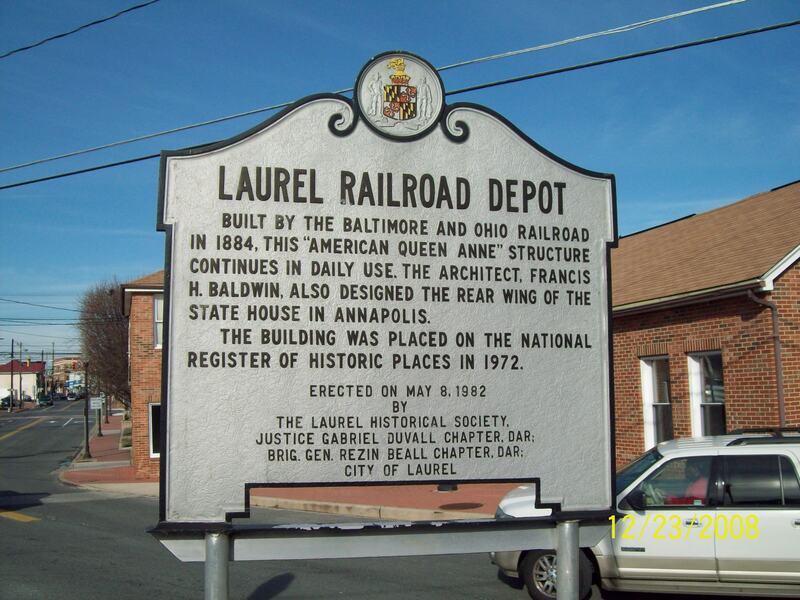 Because that would just be too easy, state Department of Transportation officials have said that it is unlikely the state will consider a “dual stop” at both the Laurel MARC station and the racetrack. 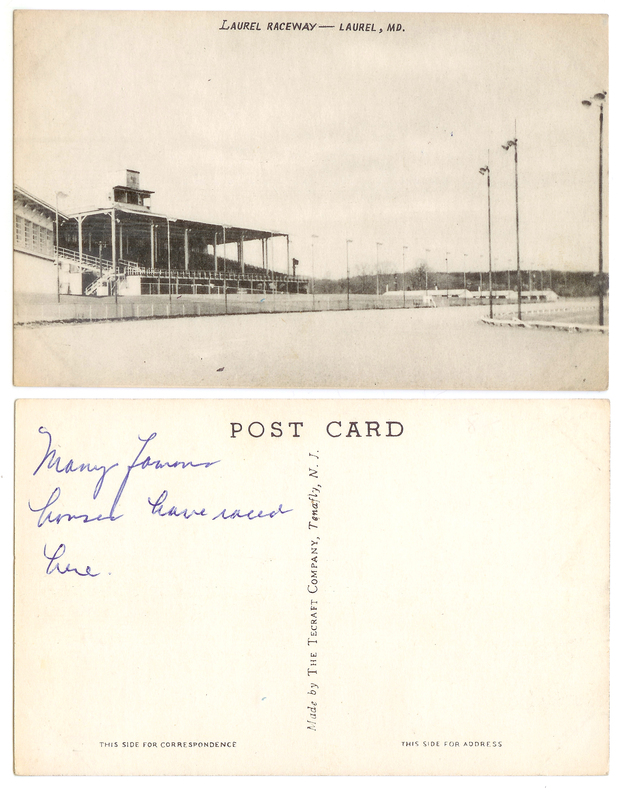 A train platform is already at the racetrack, mind you, but is listed as a flag stop (where trains will only stop when there’s a specific request) on the MARC Camden line schedule. 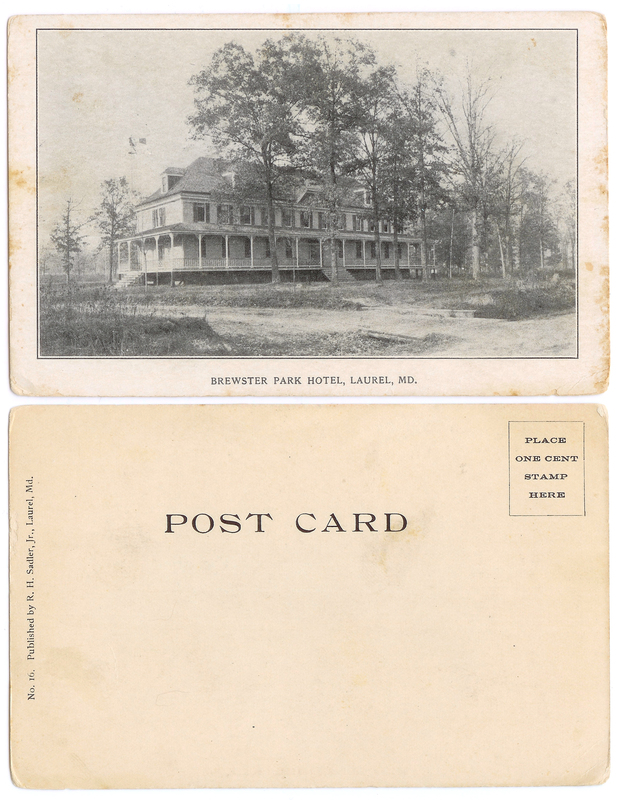 So, here comes the head-scratcher: the idea being proposed is that the DoT would close the Laurel Station—which is on the National Register of Historic Places—in favor of building a new stop at the racetrack, a mere 2,500 feet away. 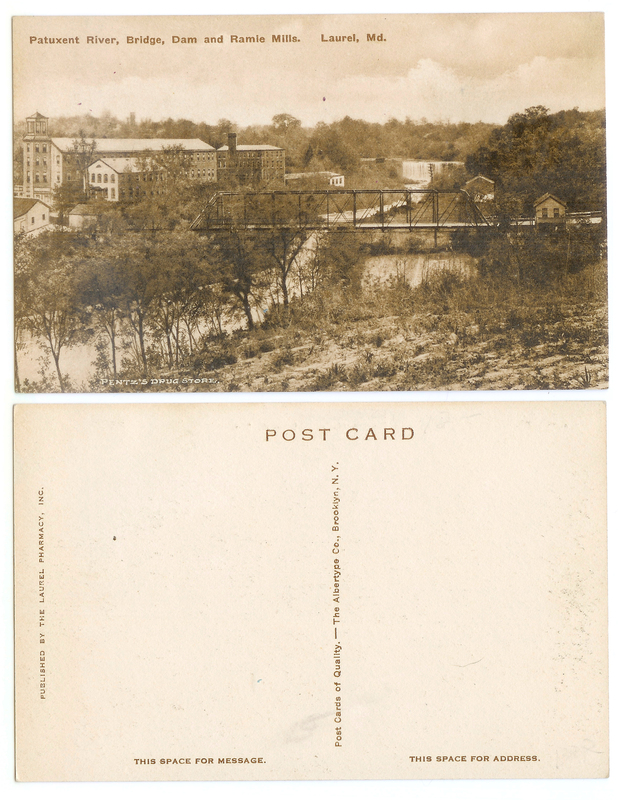 Where, again, there is already a train platform in place. 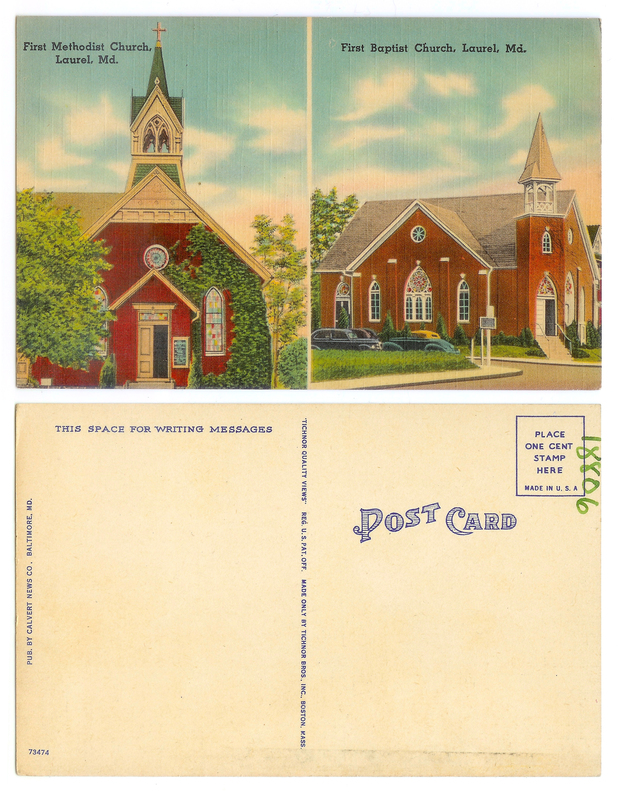 I’m not sure there’s a more polite way to put this, so I’ll just ask: Are you f***ing kidding me? 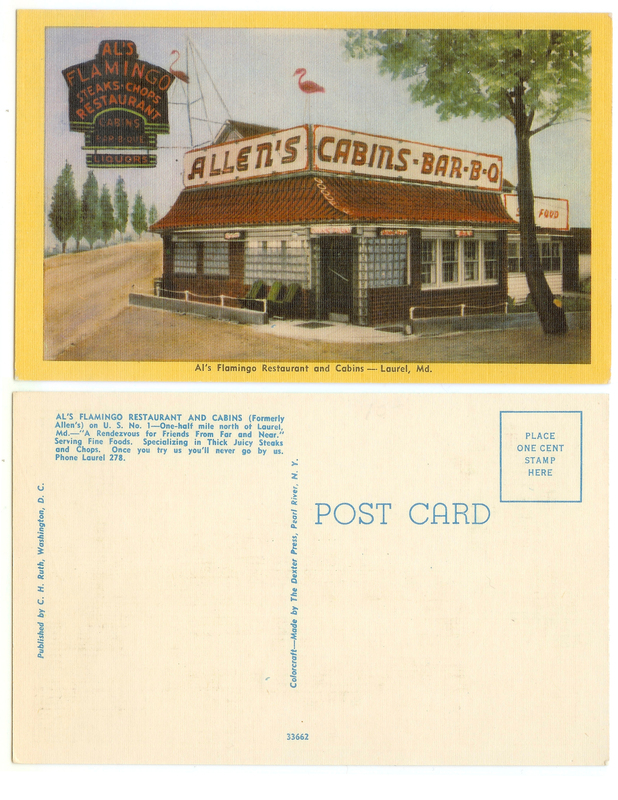 Don’t get me wrong—I’m a huge supporter of both places. 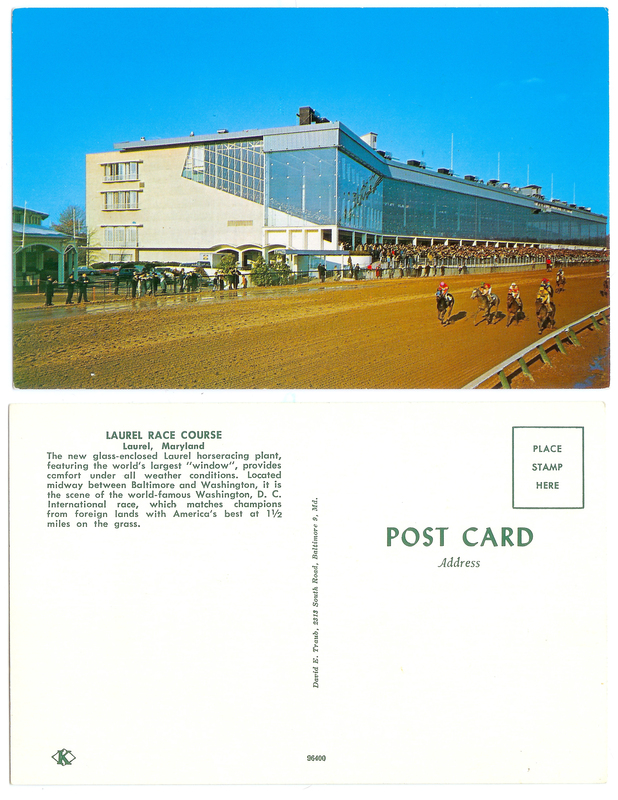 More than anything, I’d love to see a resurgence of horse racing in Laurel, and have Laurel Park once again become the premier venue that it can be. 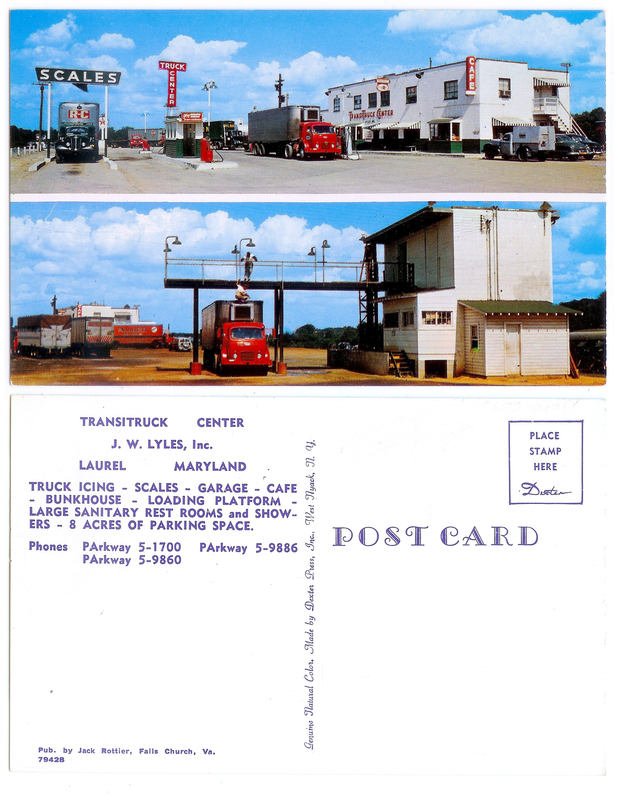 But certainly not at the expense of endangering what might be the town’s most recognizable landmark—a landmark that, frankly, has been more functional than the track itself in recent years. 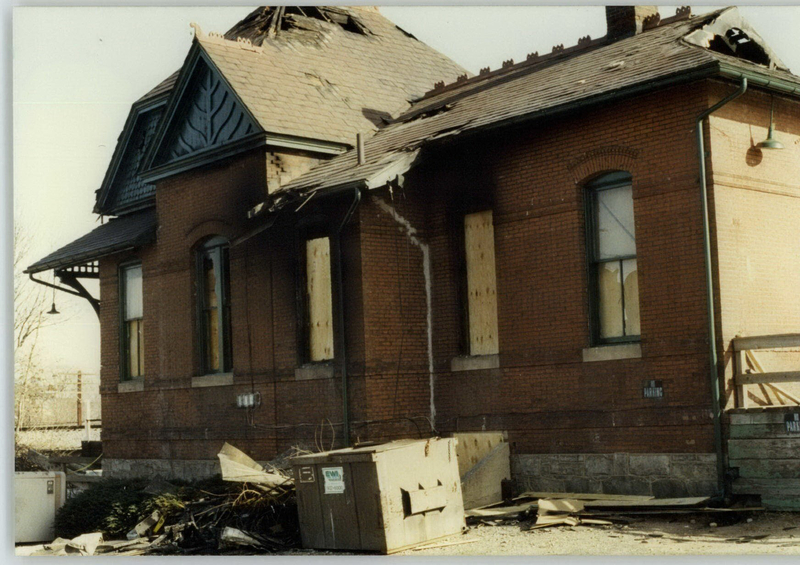 Granted, I can’t see anyone in their right mind coming out and proposing that the old train station be demolished—to my knowledge, nothing like that has been discussed. 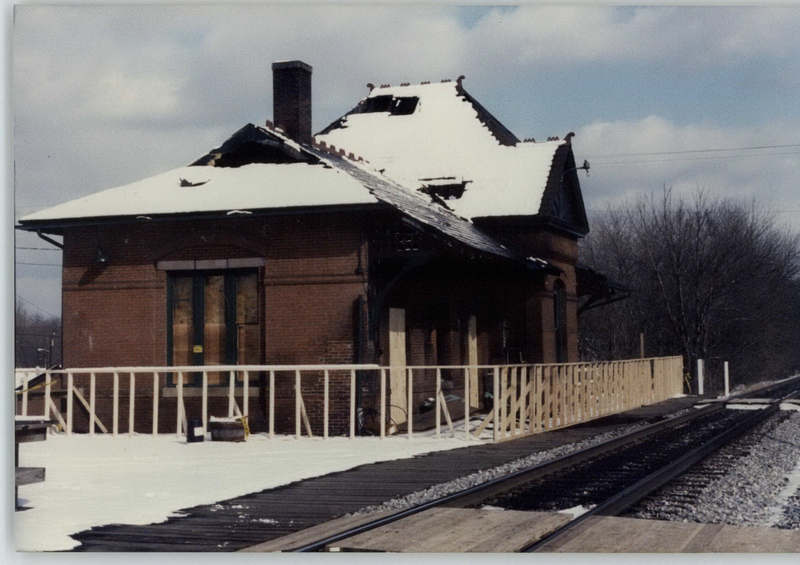 But what would happen if/when the historic station ceases to be an active stop on the MARC line? 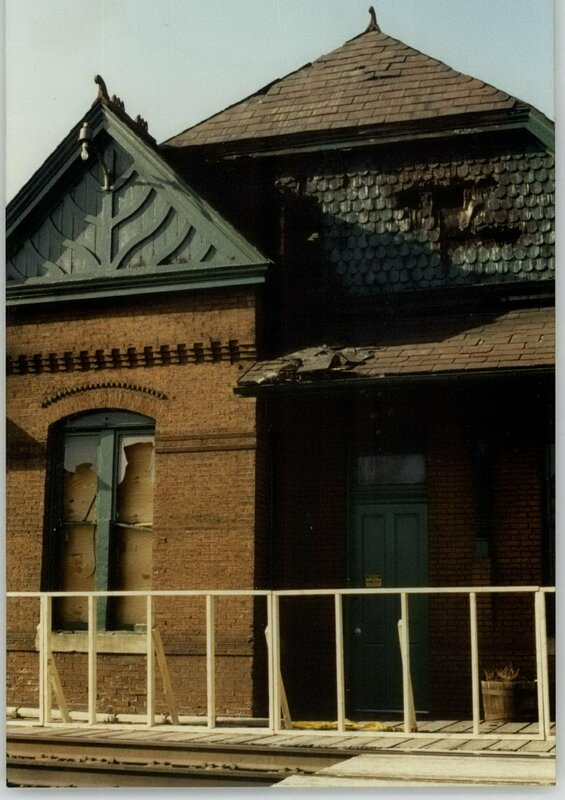 We already know how vulnerable the city’s old buildings tend to be, especially when they’re vacant. 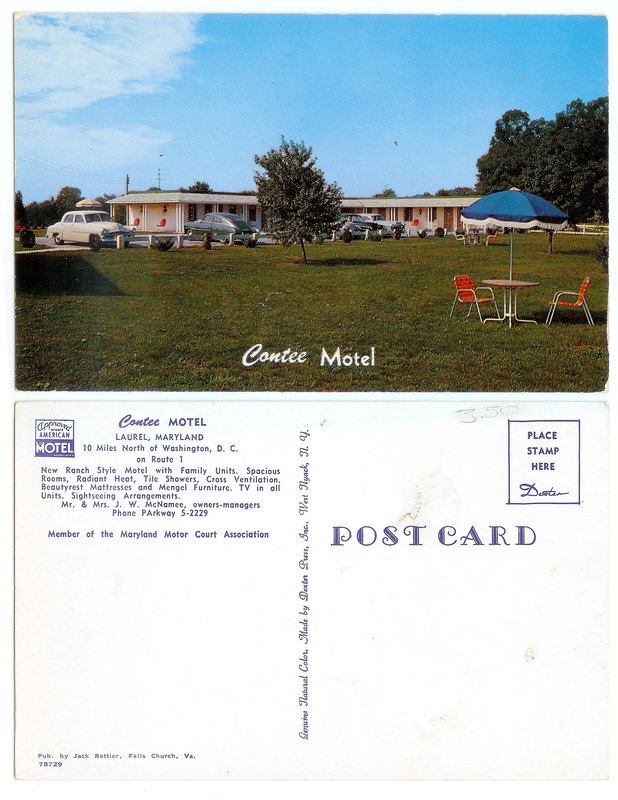 With the expectation that cooler, more rational heads will ultimately prevail in this, let’s look at some more reasonable options. 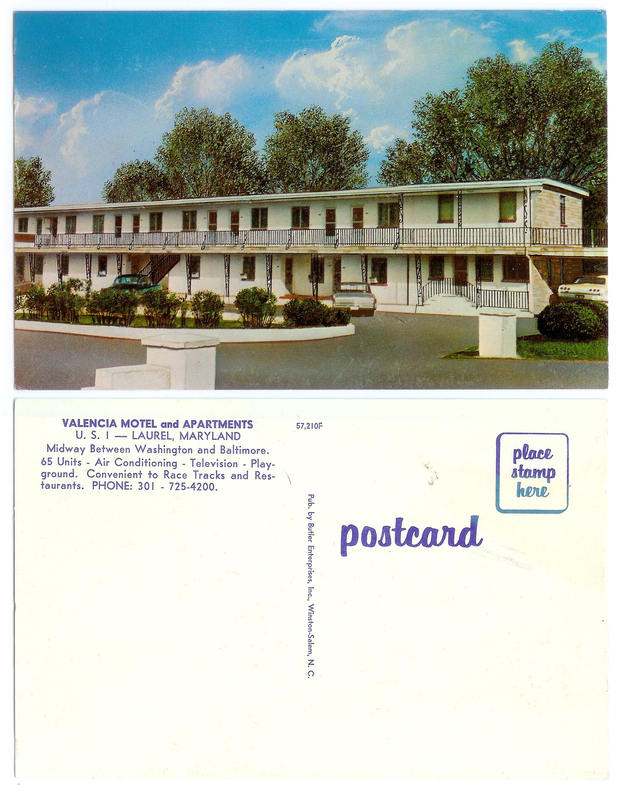 First, there’s the basic issue of supply and demand. 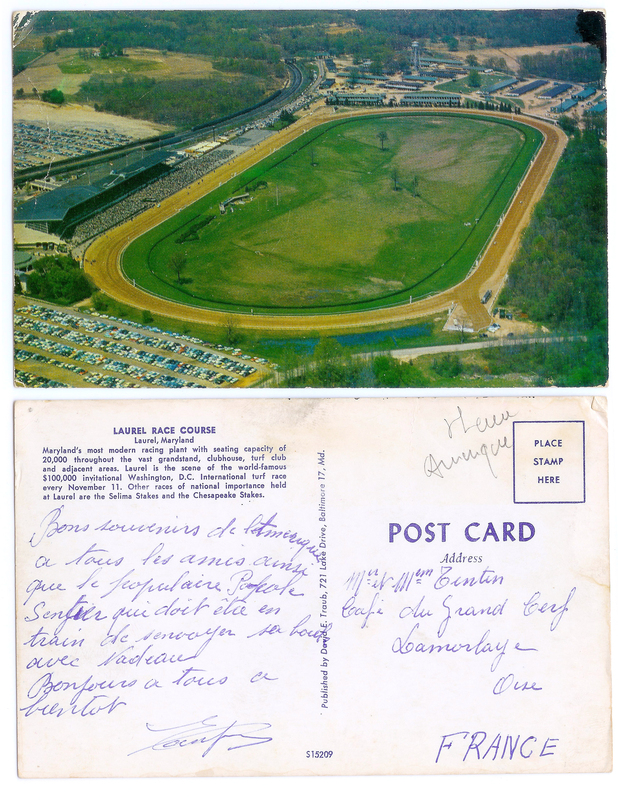 If enough people genuinely start taking the train to the races again, as they did back in the early-to-mid-20th century, there’s no reason why the Department of Transportation shouldn’t reinstate Laurel Park as an active stop on the MARC line. 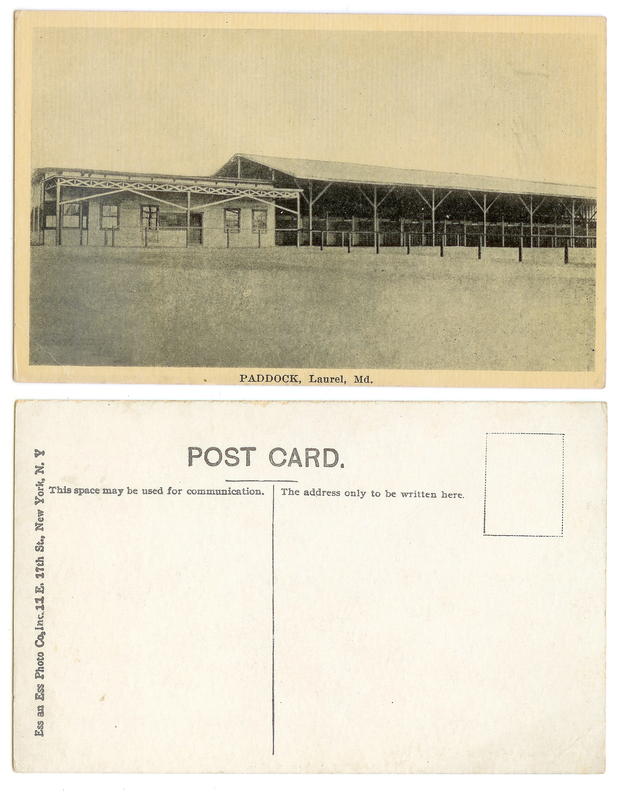 But even then, closing the town’s historic station wouldn’t make sense, logistically, especially as it relates to everyday commuters with no interest in visiting the race track. 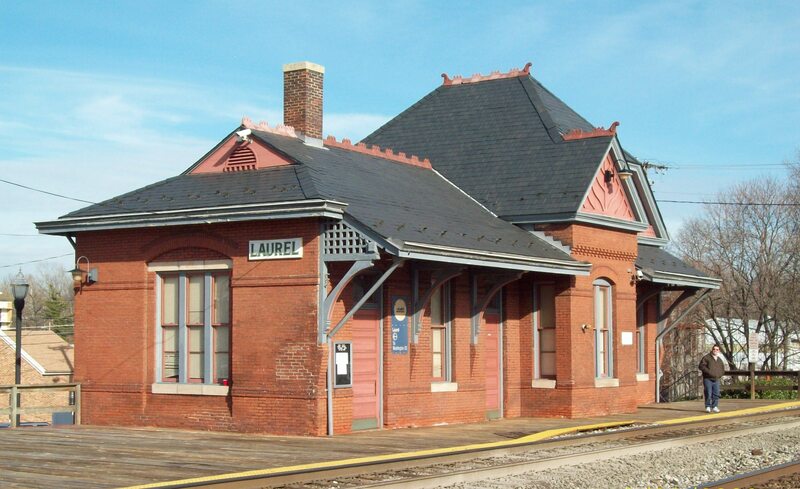 The current station sits in the heart of Laurel at the base of Main Street and provides easy access. 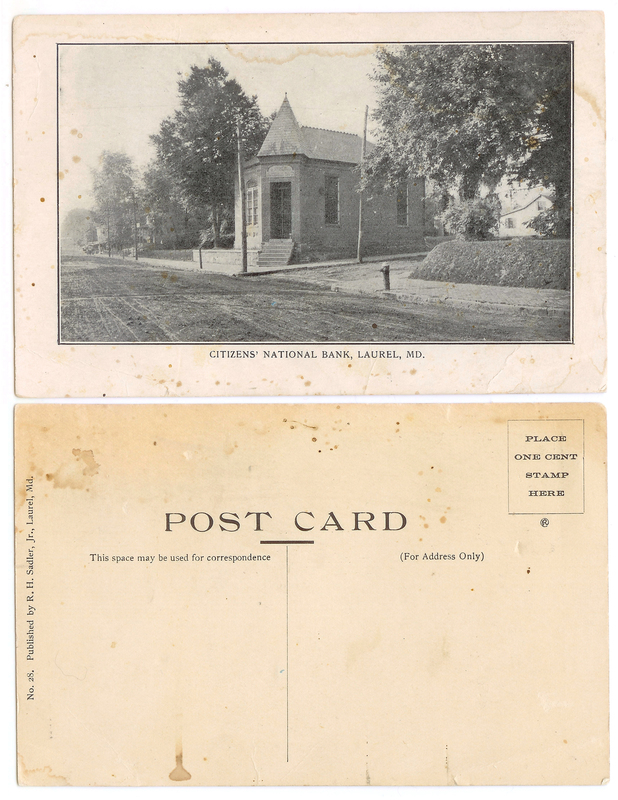 From a marketing standpoint, its historic qualities also benefit the commuter rail industry—the classic, Queen Anne styling of the station literally makes you want to take the train… in a way that a new, more modern facility probably wouldn’t. 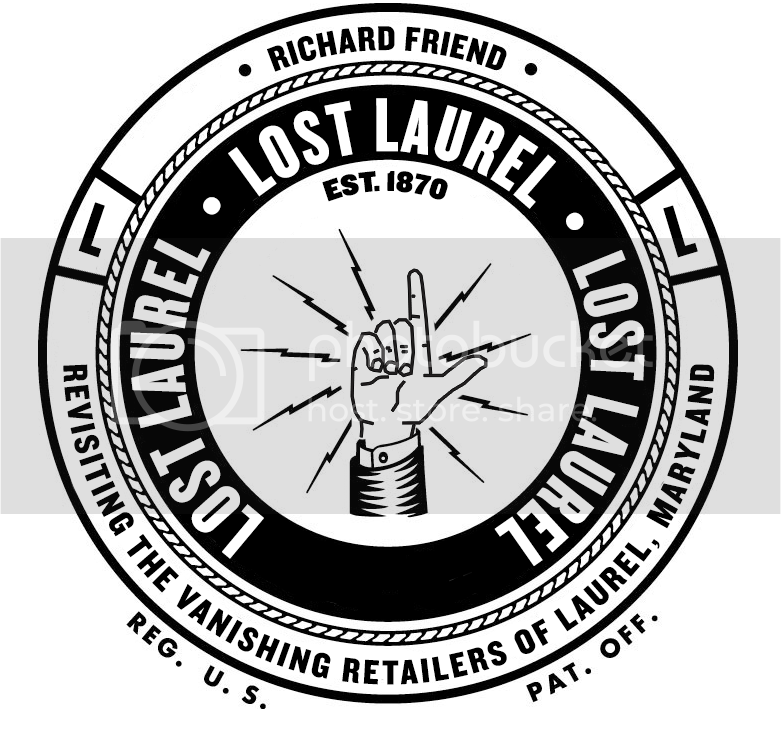 As a graphic designer myself, I have serious doubts that it was created by a professional. 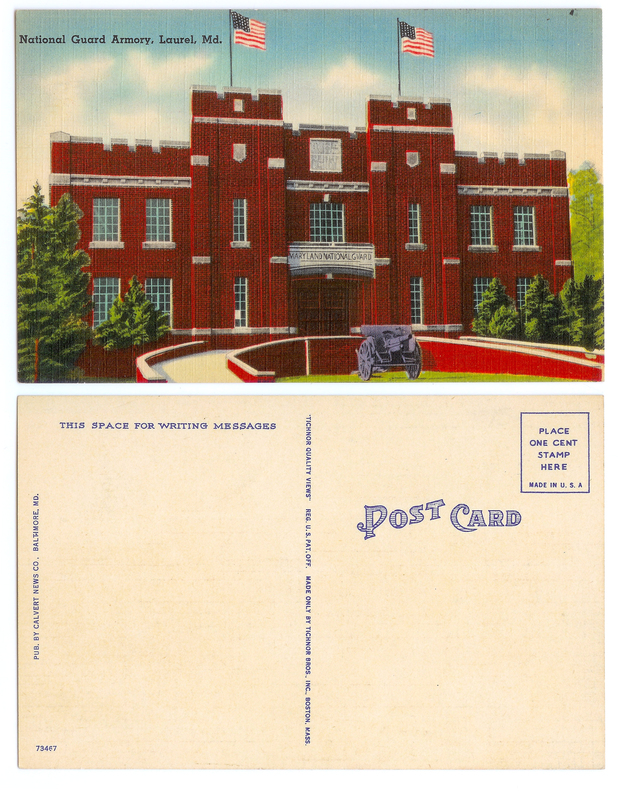 It’s poorly executed for a number of reasons, but I digress. 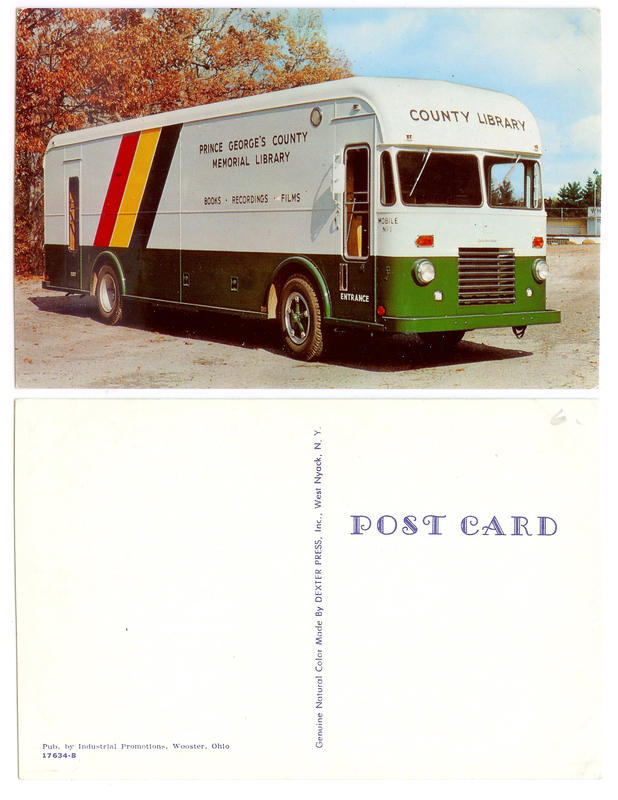 Their logo problems aren’t the main concern here. 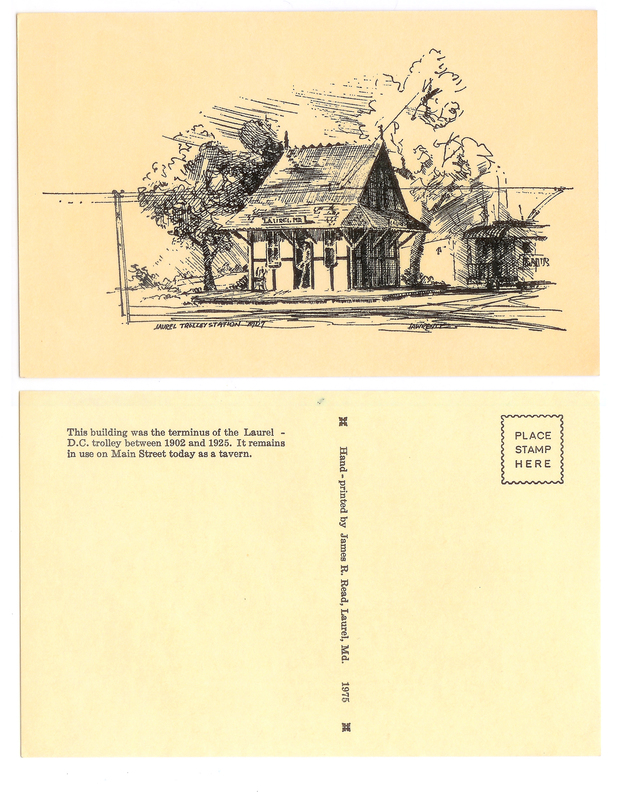 And from a practical standpoint, (e.g. 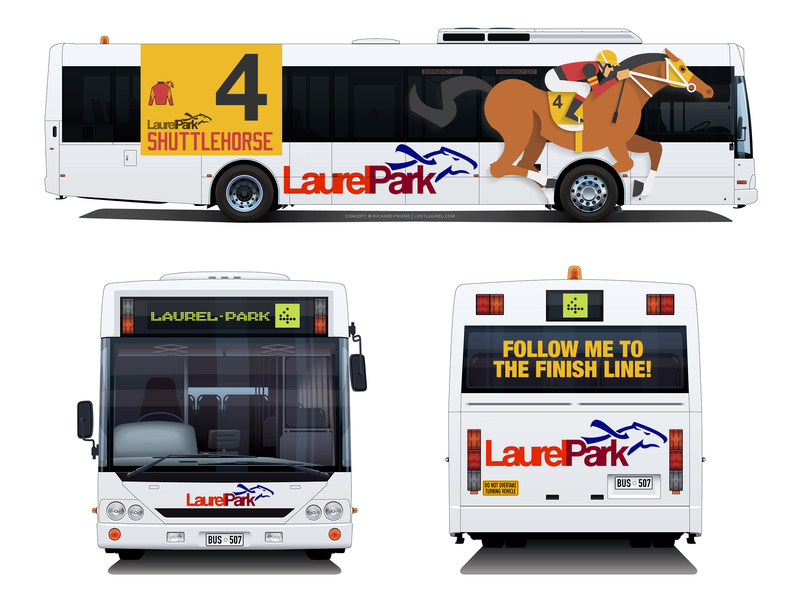 the number of people actually going to the race track from the train station) wouldn’t shuttle buses also just make more sense? 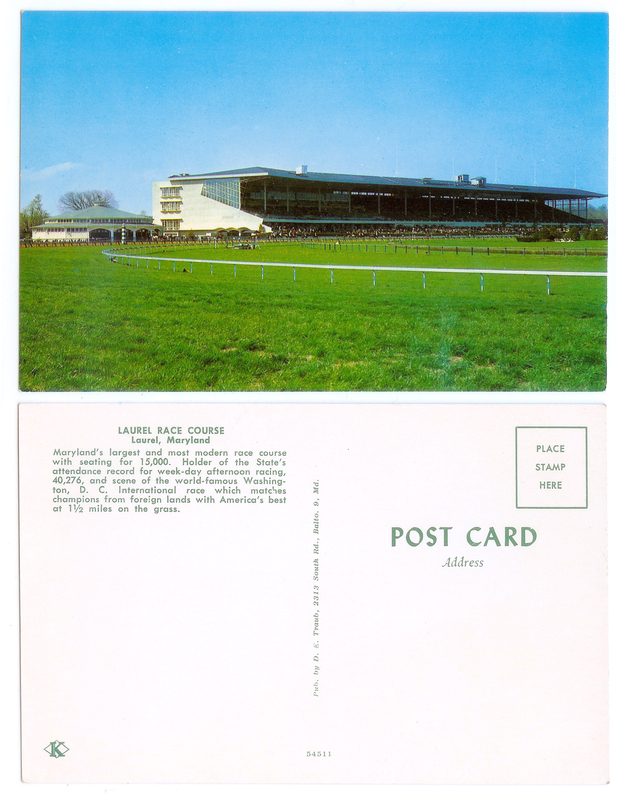 At least until Laurel Park starts generating the types of crowds that might require more drastic measures? 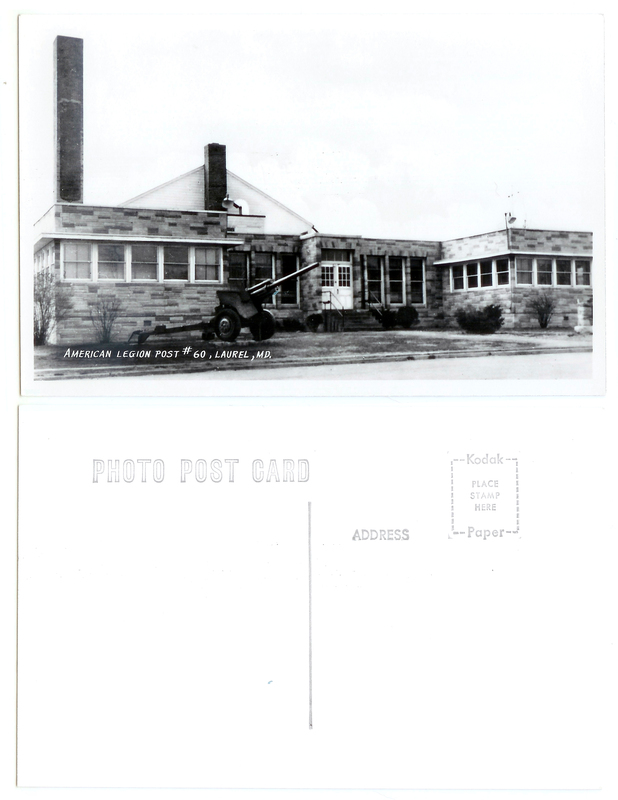 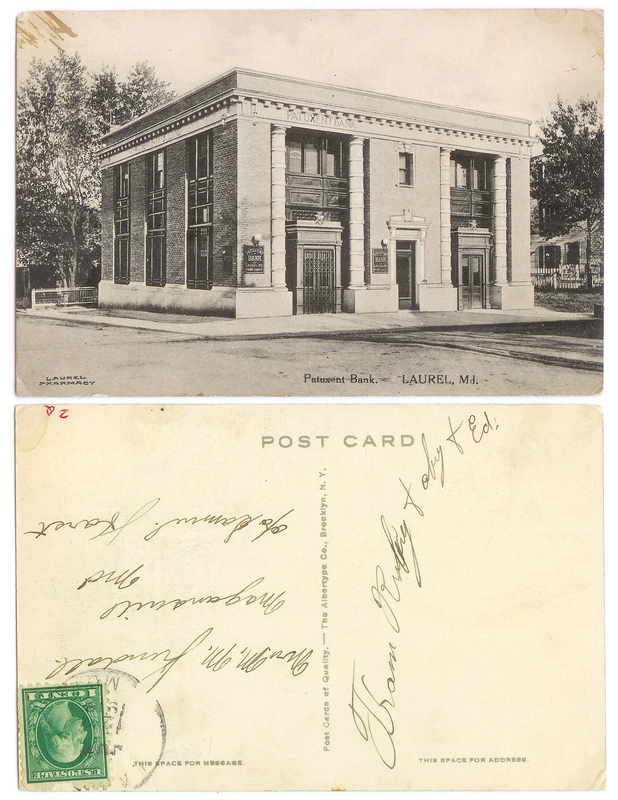 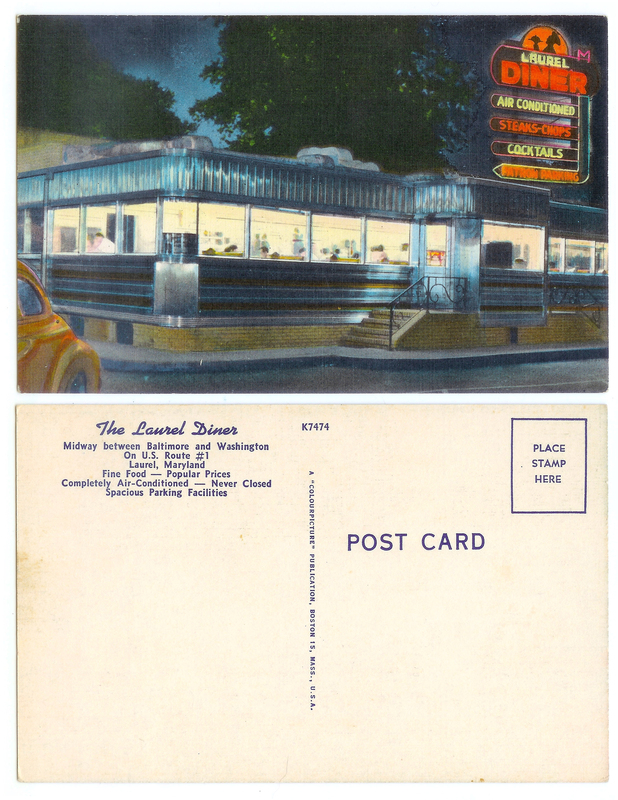 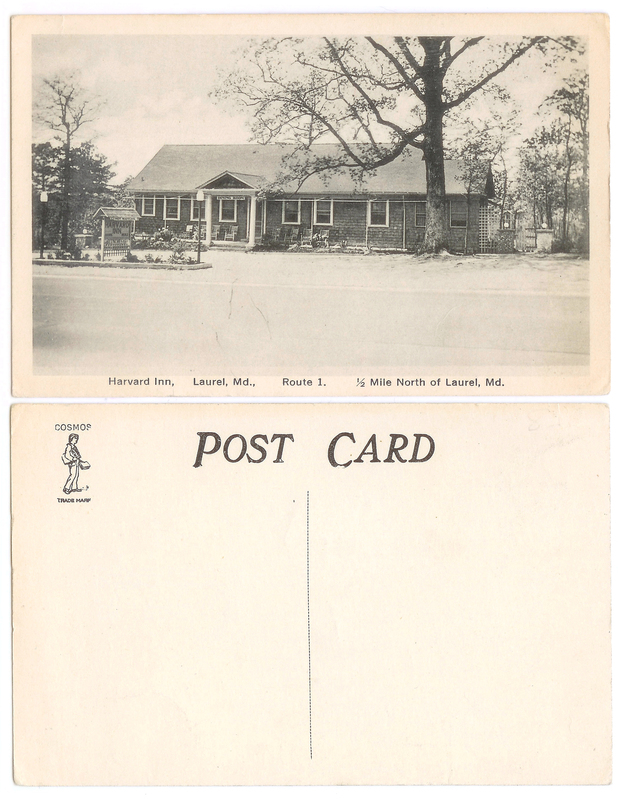 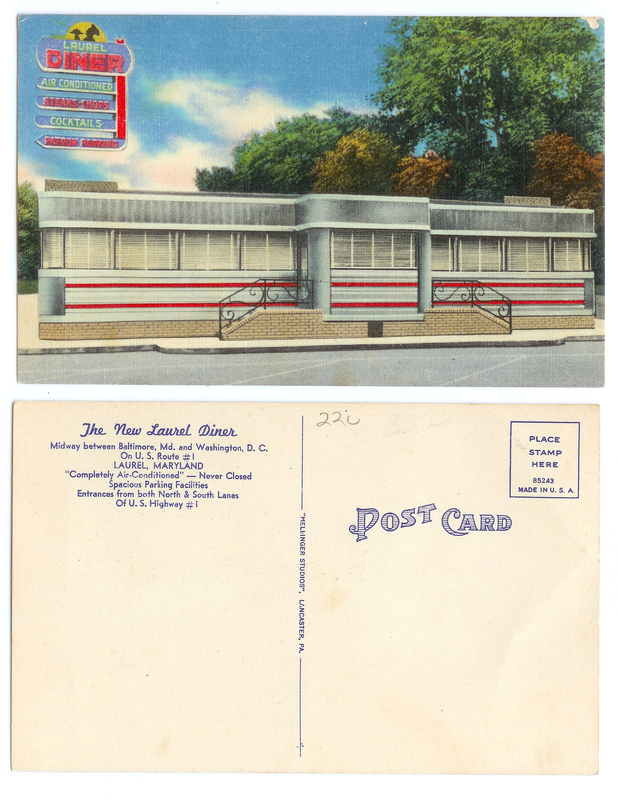 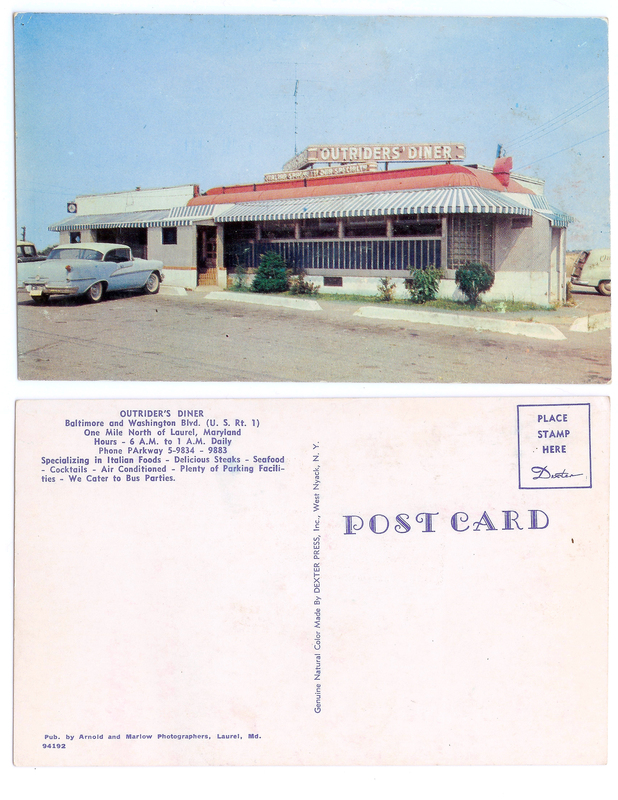 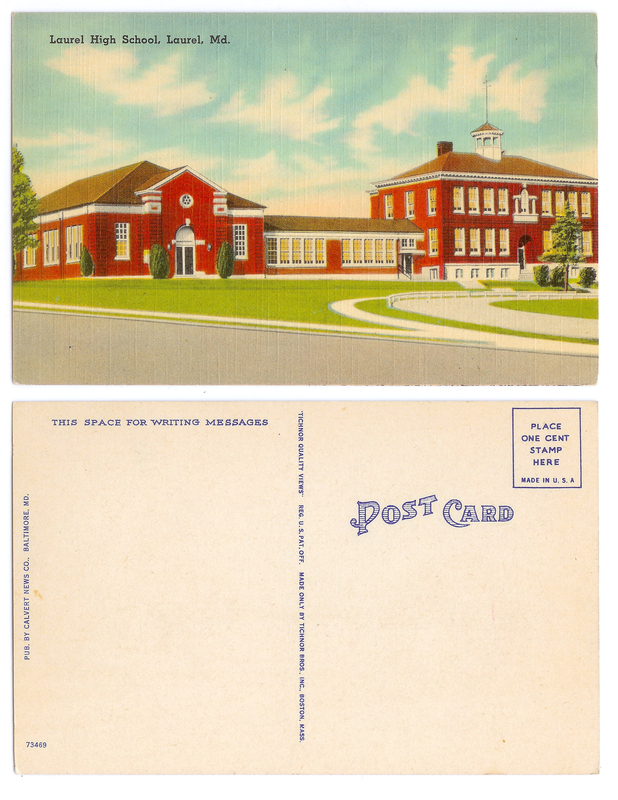 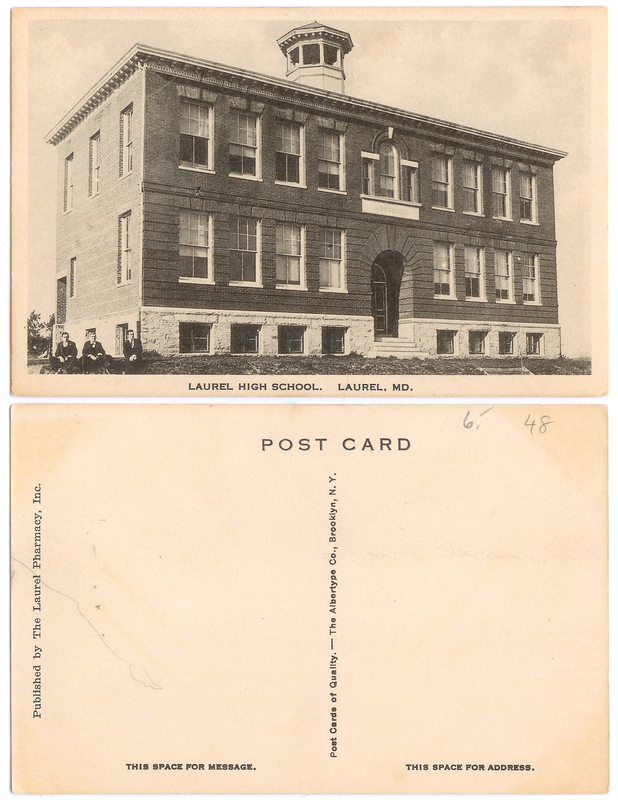 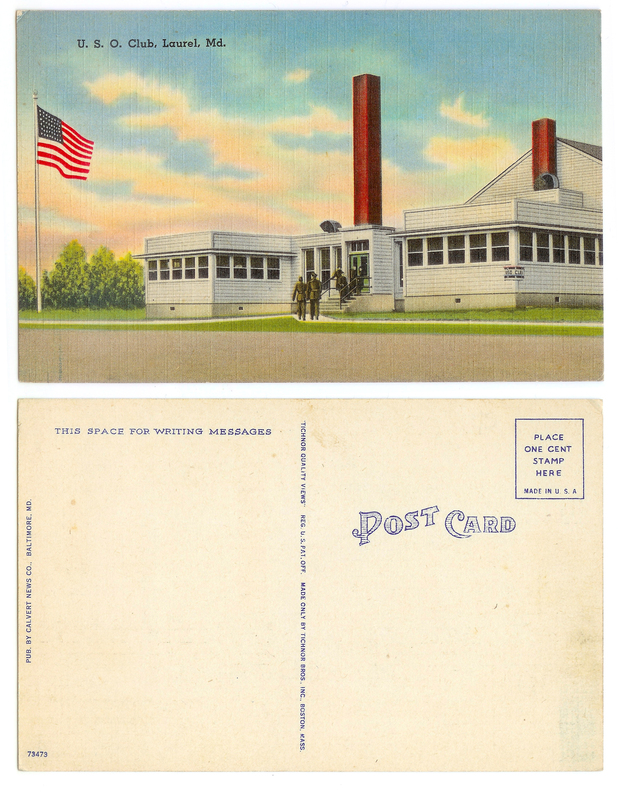 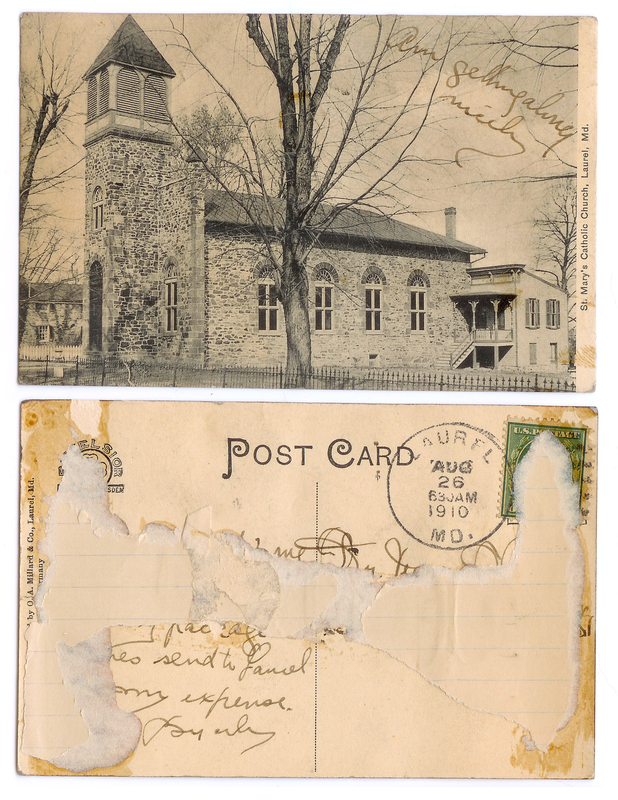 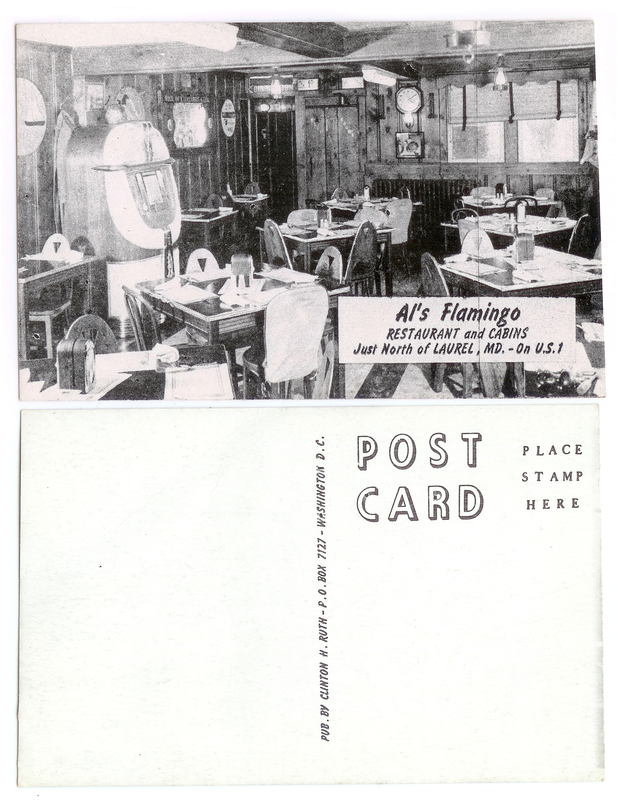 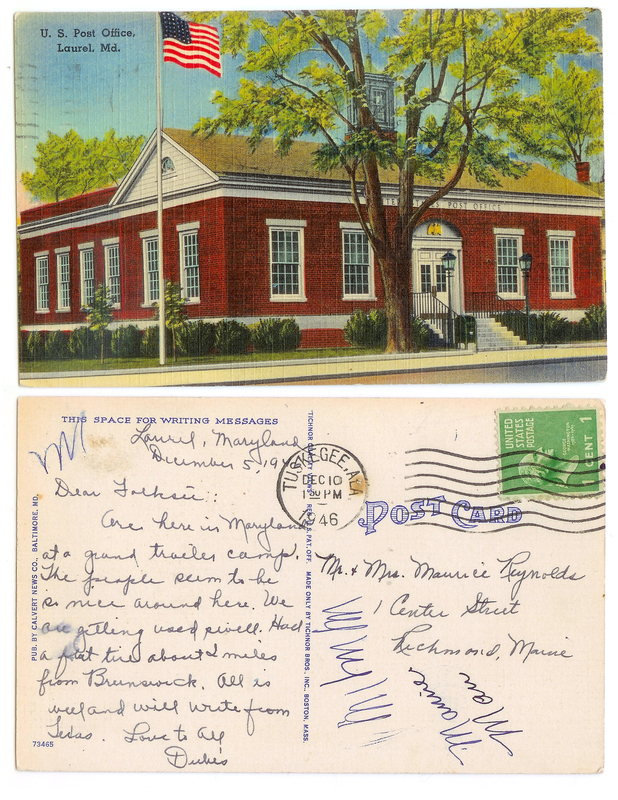 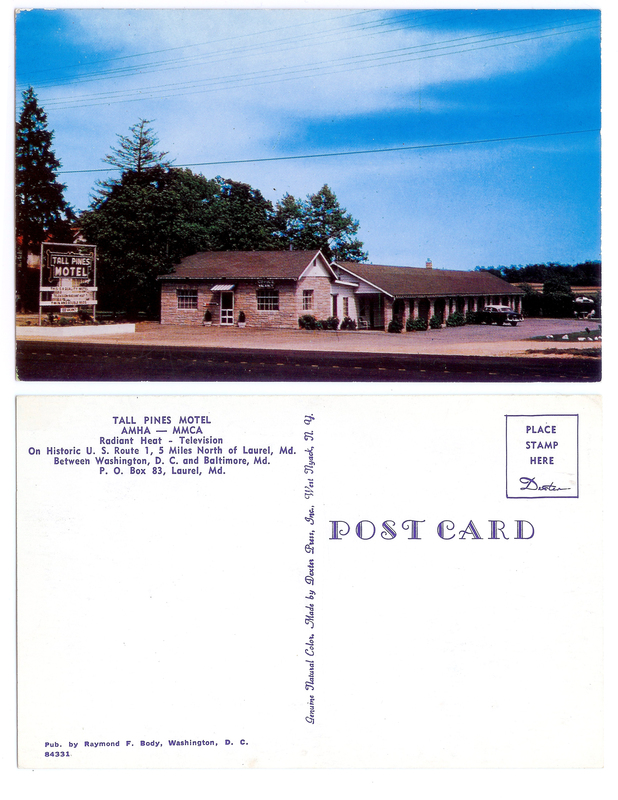 Chances are, you’ve seen at least one vintage Laurel postcard in your life before. 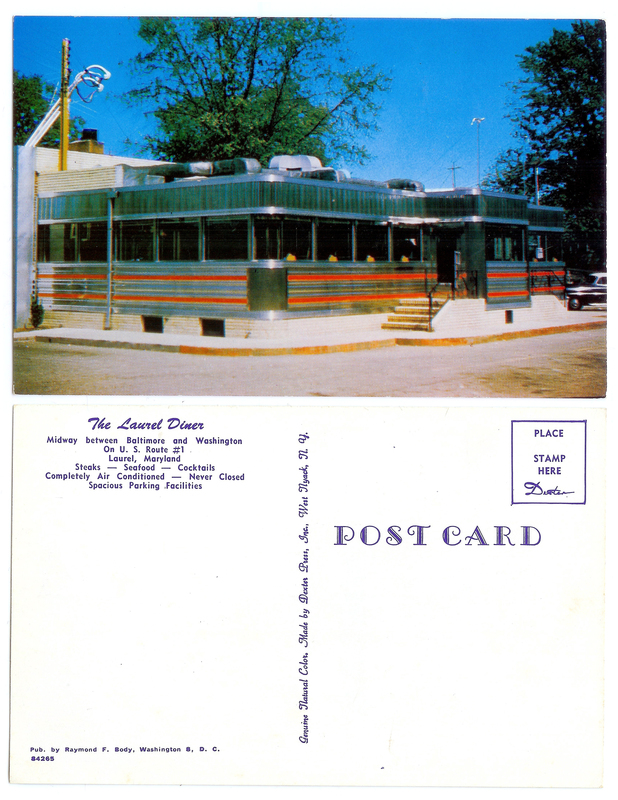 Maybe it was a 1950s picture of the Laurel (Tastee) Diner. 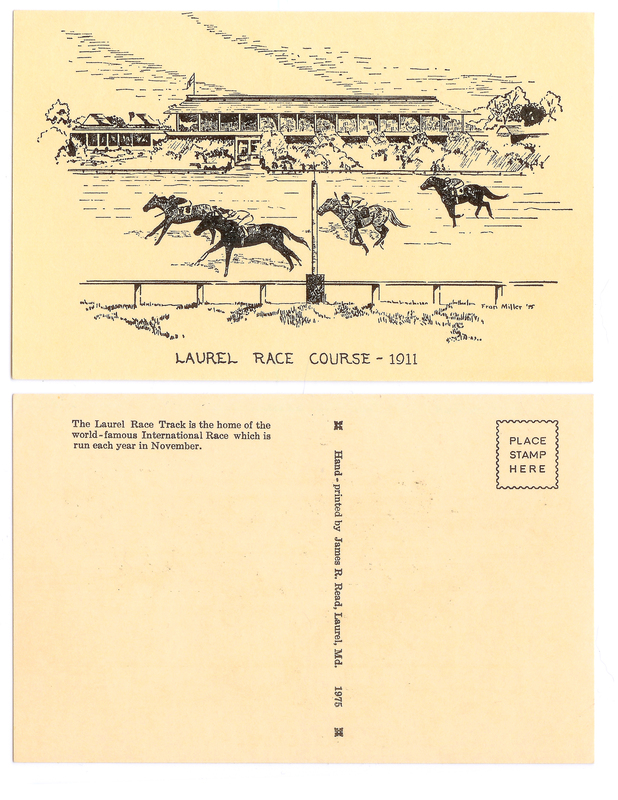 Or more likely, it was a memento from Laurel’s most popular attraction throughout the past century, Laurel Park Racecourse. 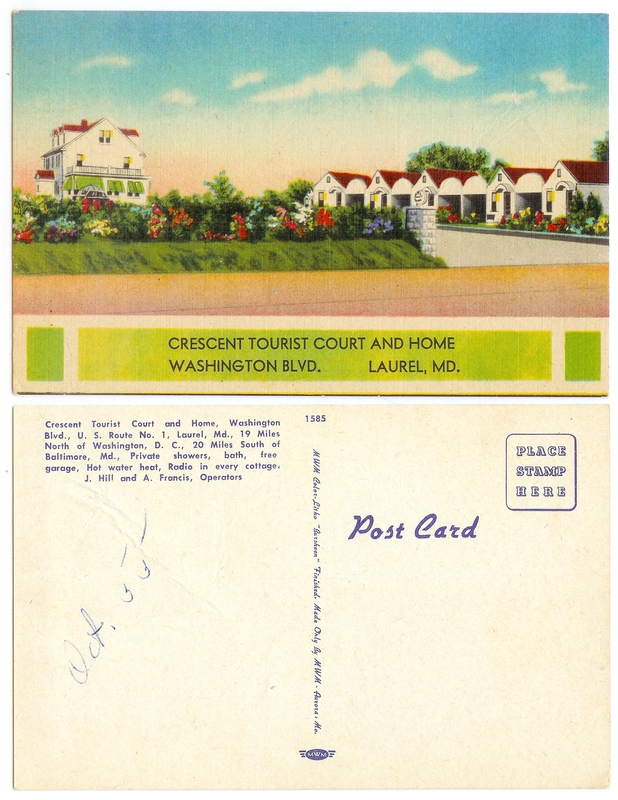 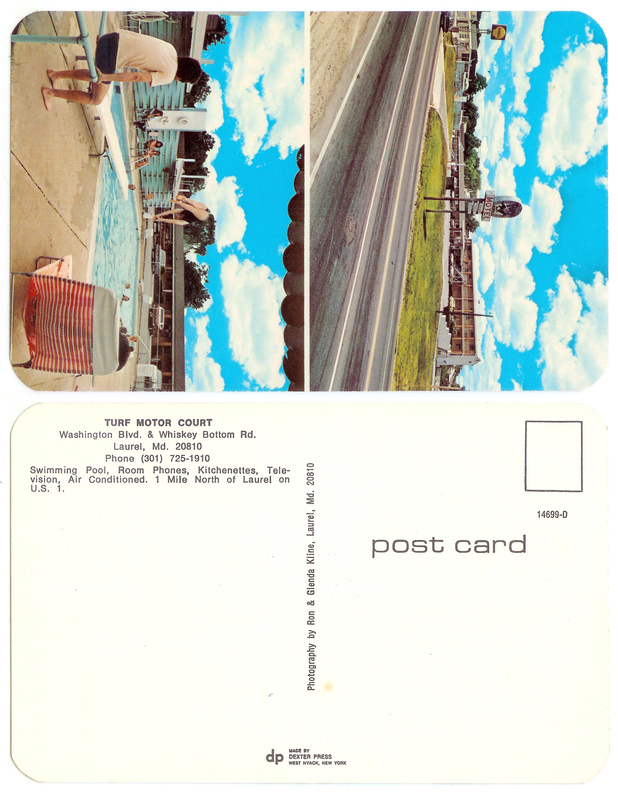 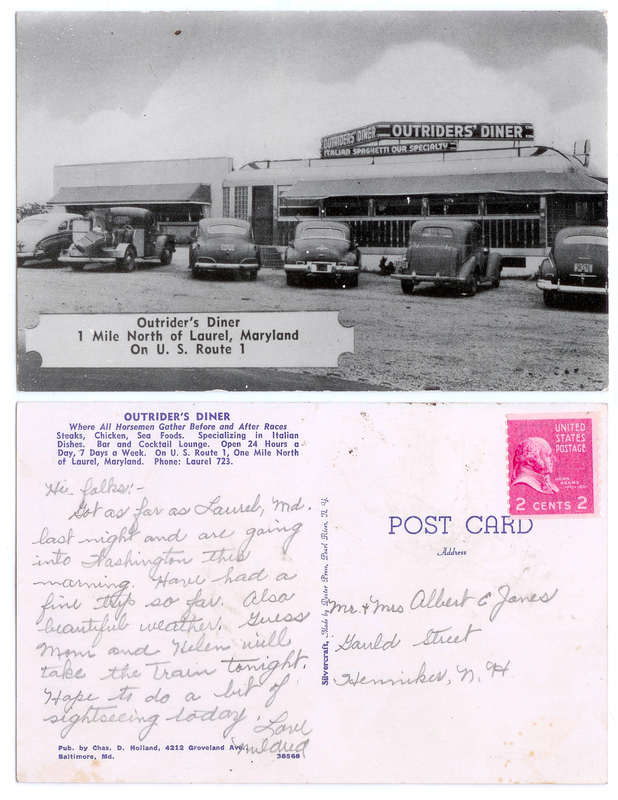 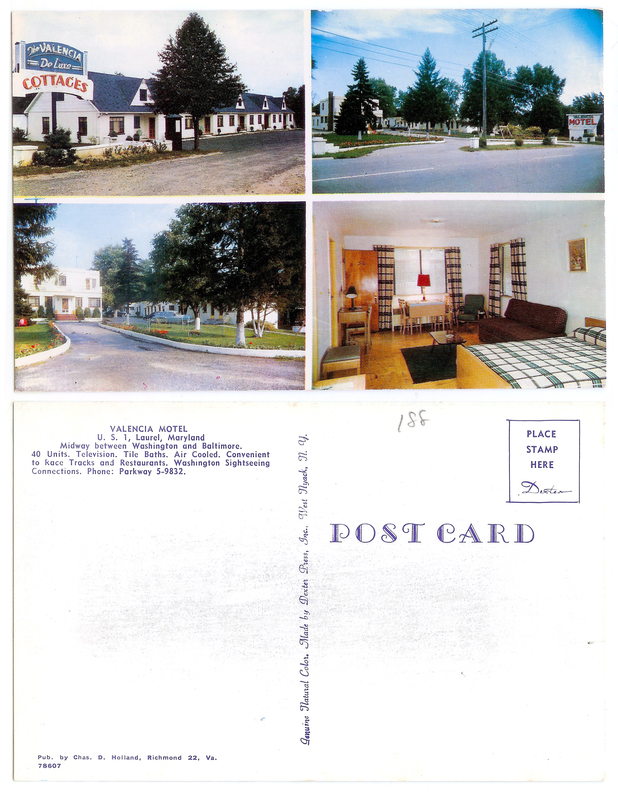 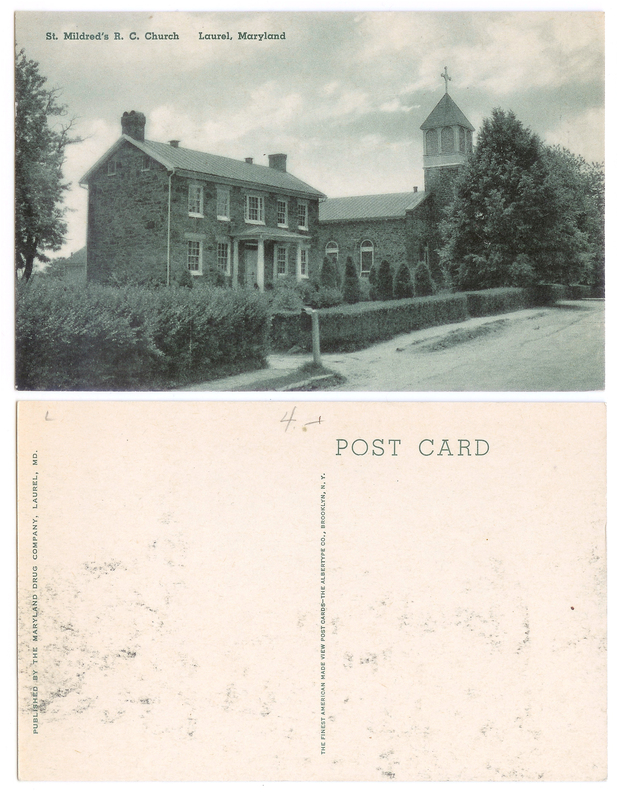 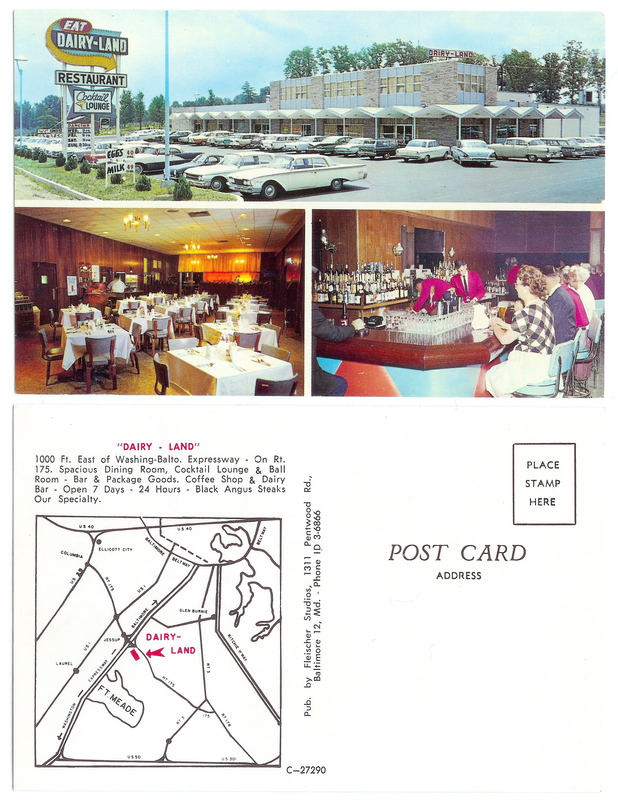 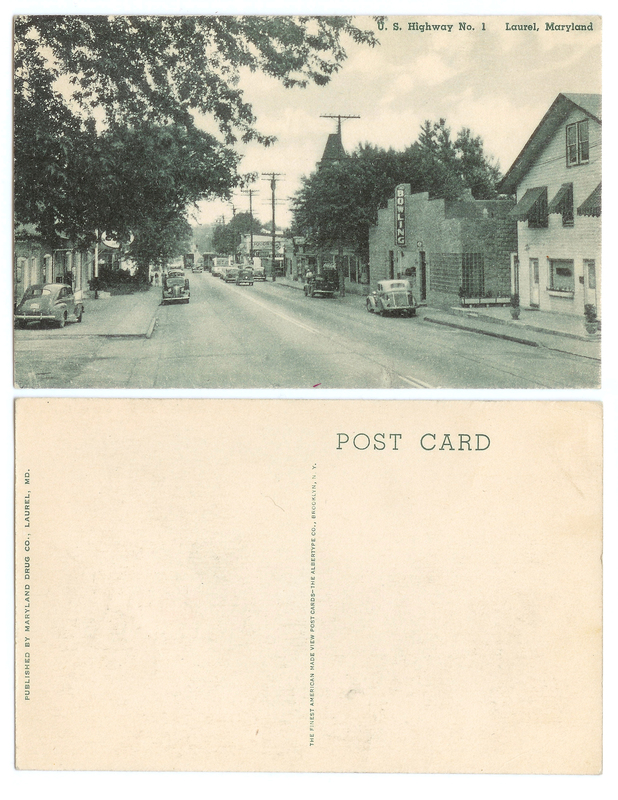 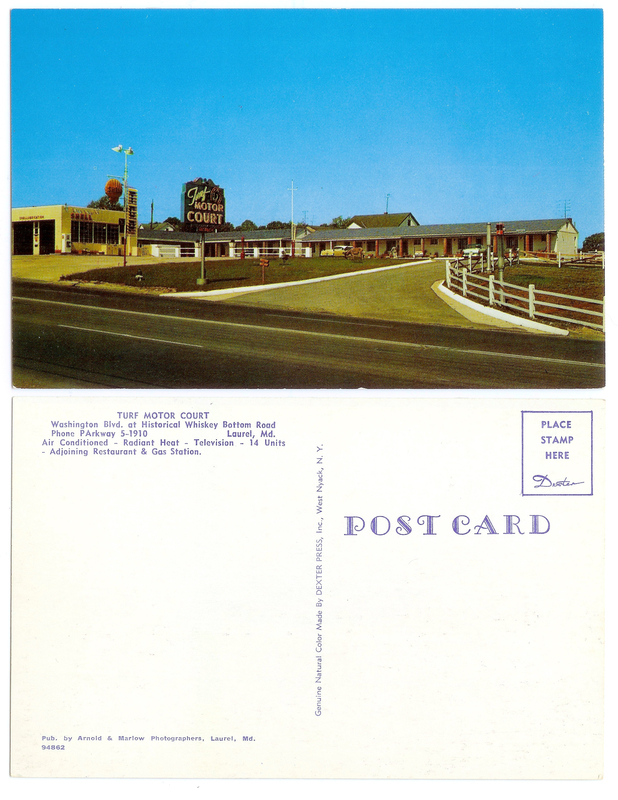 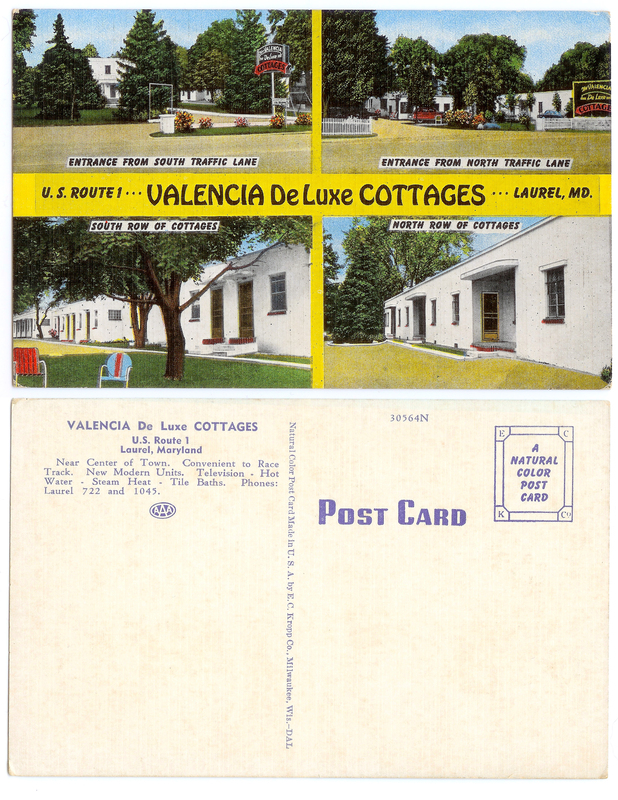 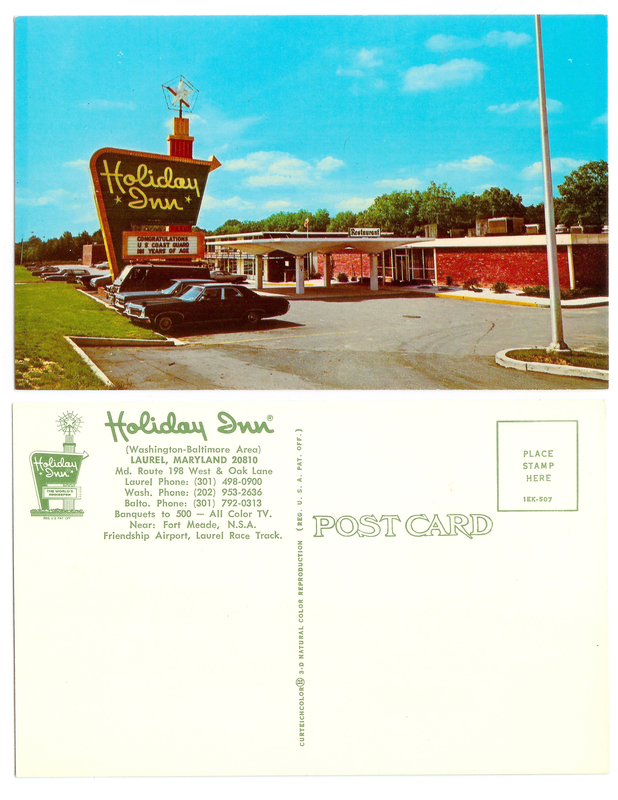 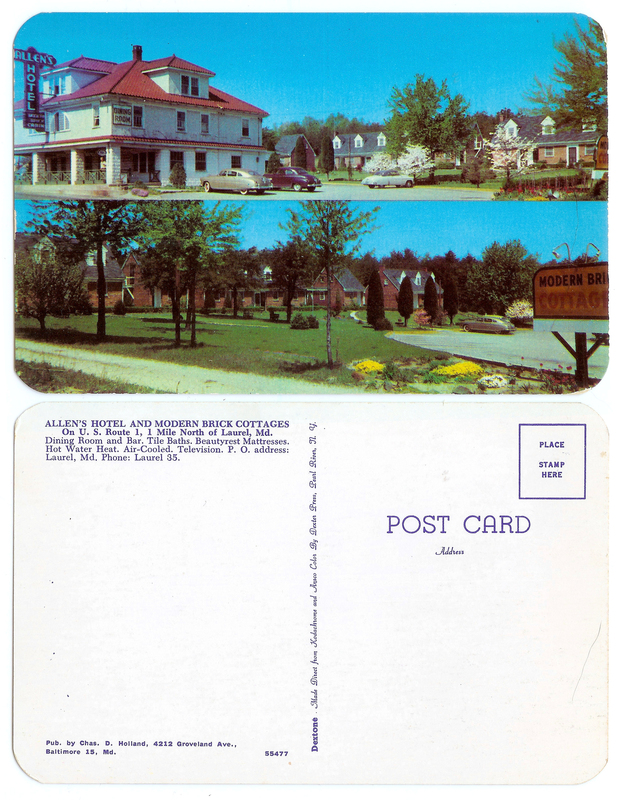 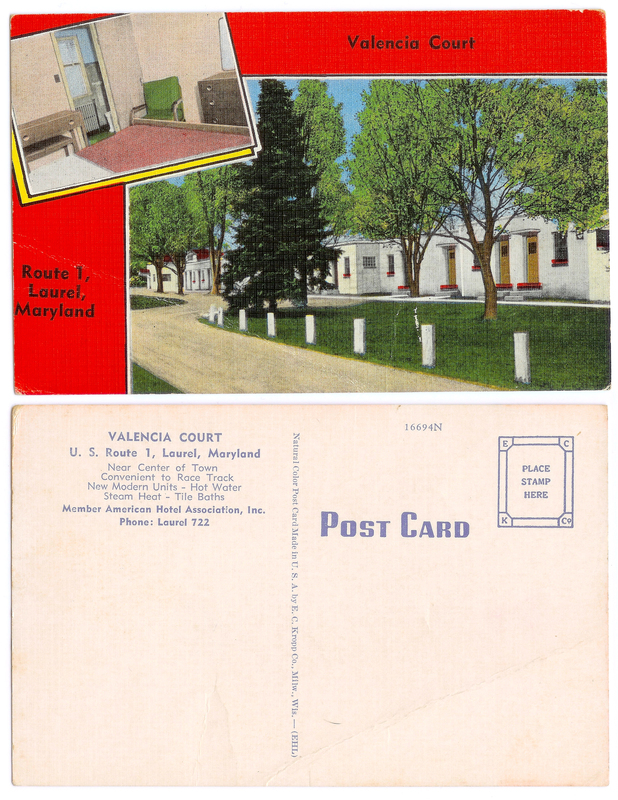 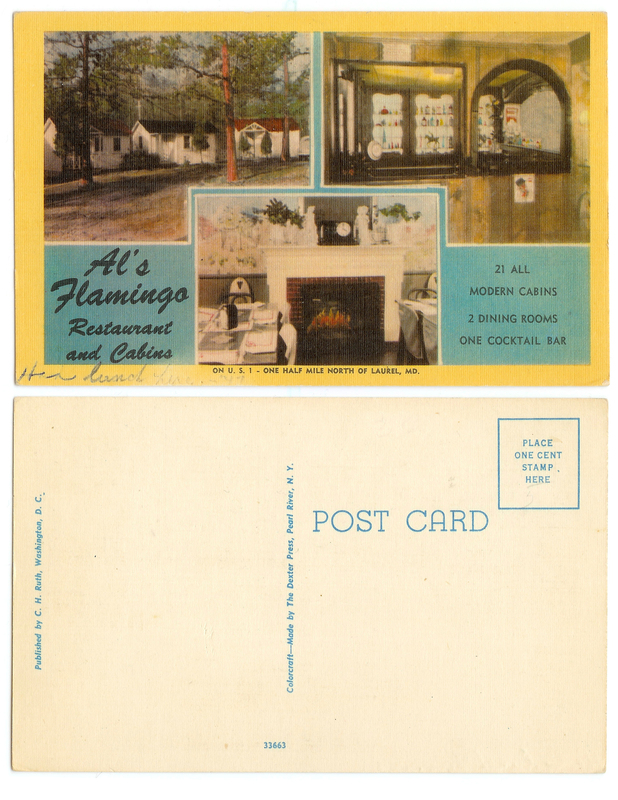 Admittedly, I can’t recall having seen any postcards of Laurel while I was growing up there in the 1980s. 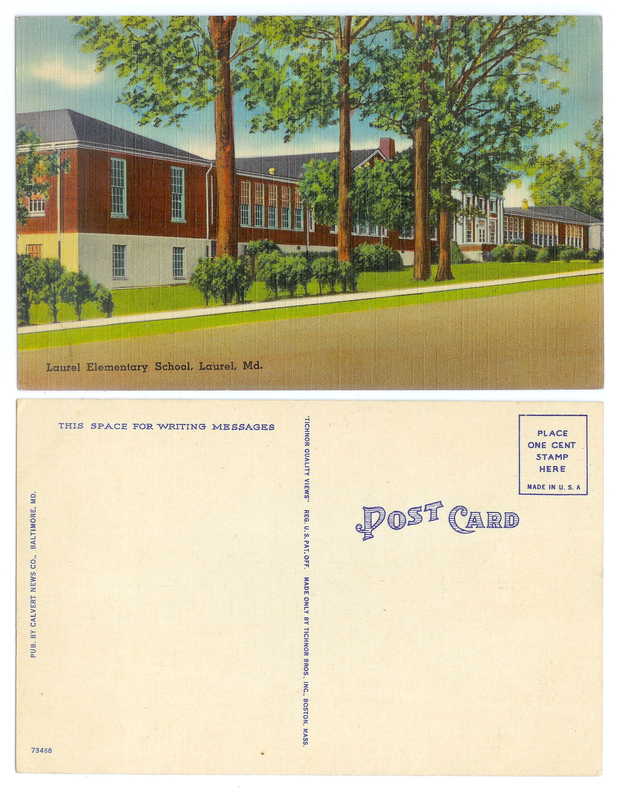 By then, most had been relegated to personal scrap books (and unfortunately, quite a few probably ended up in garbage cans). 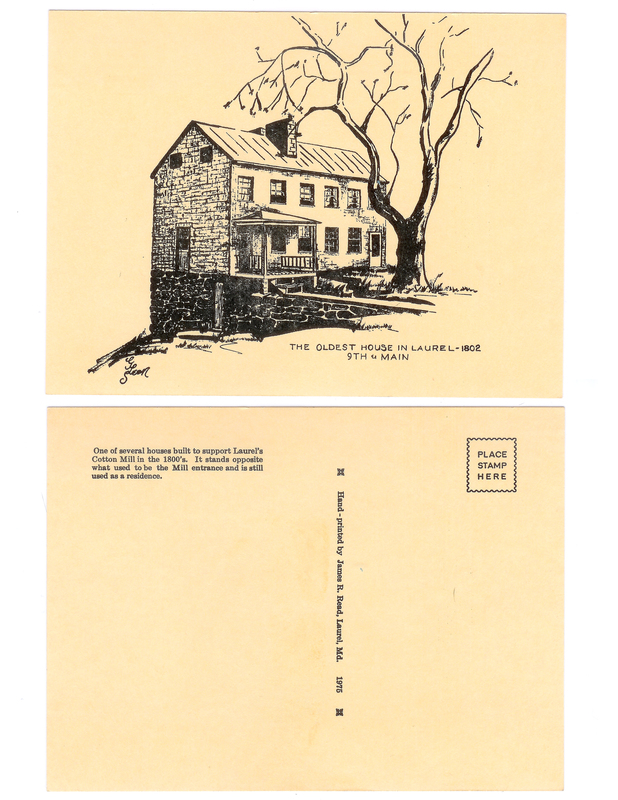 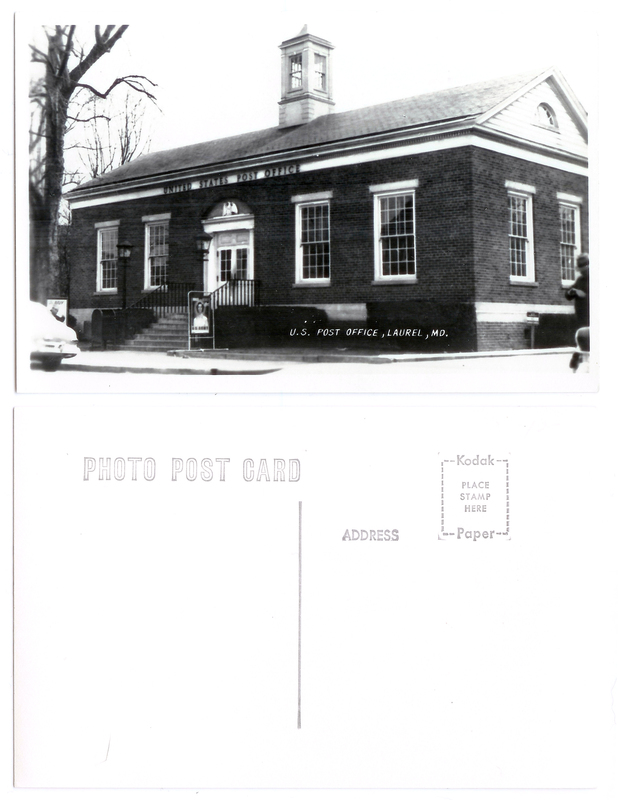 The Laurel Historical Society has undoubtedly preserved many, and the Laurel Library has at least thoughtfully photocopied some of the oldest examples. 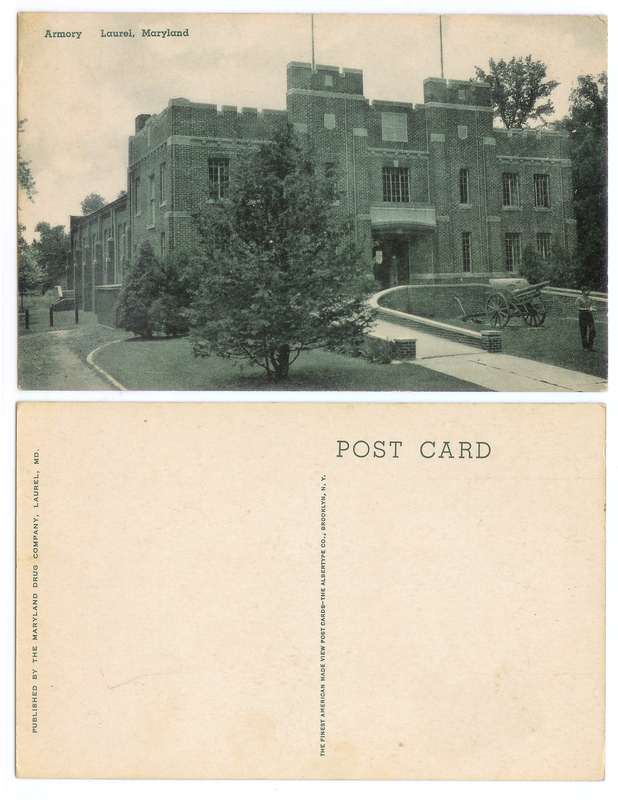 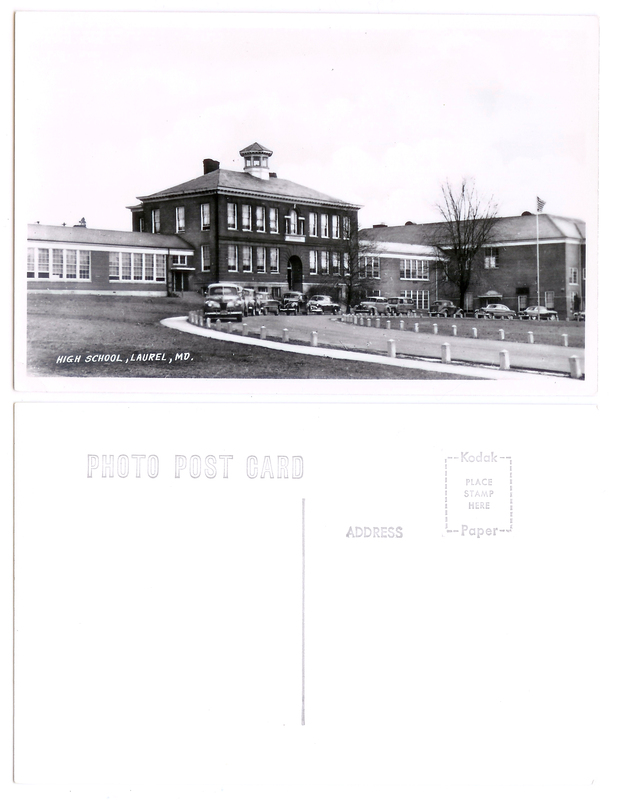 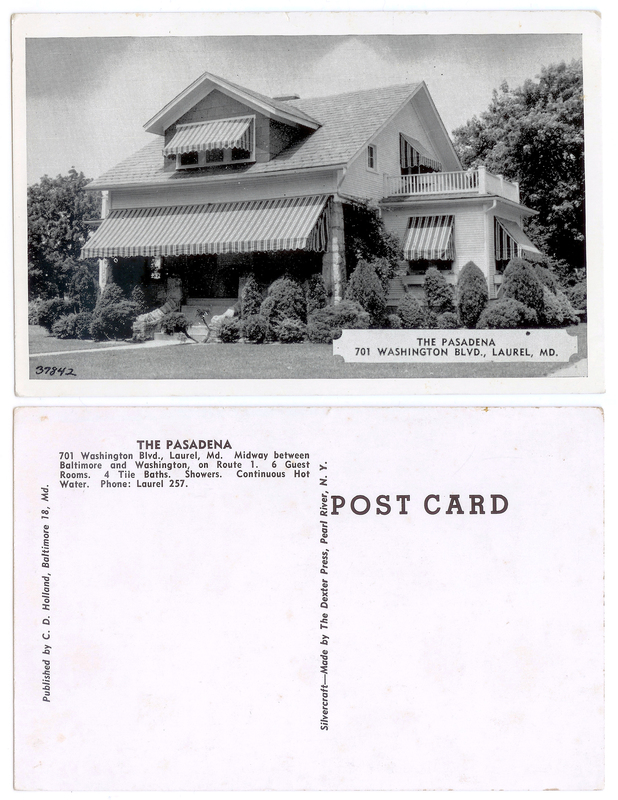 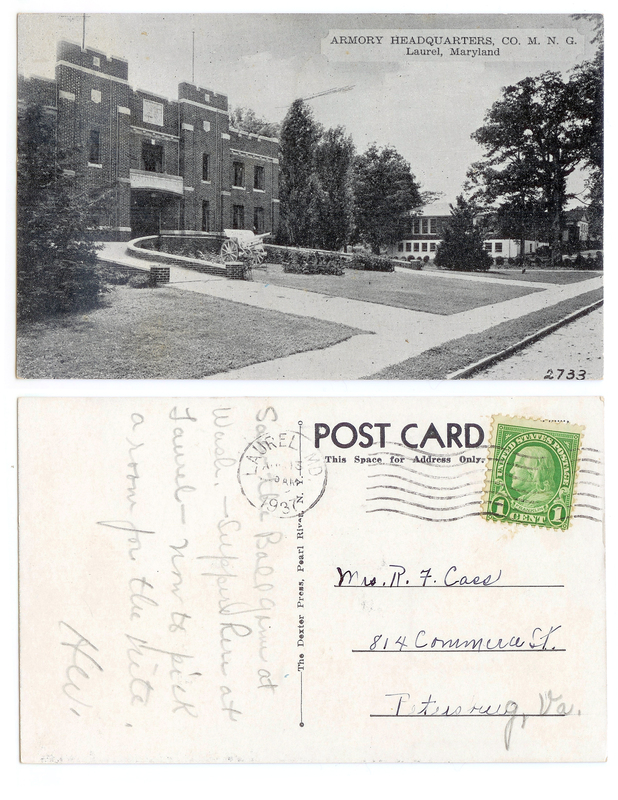 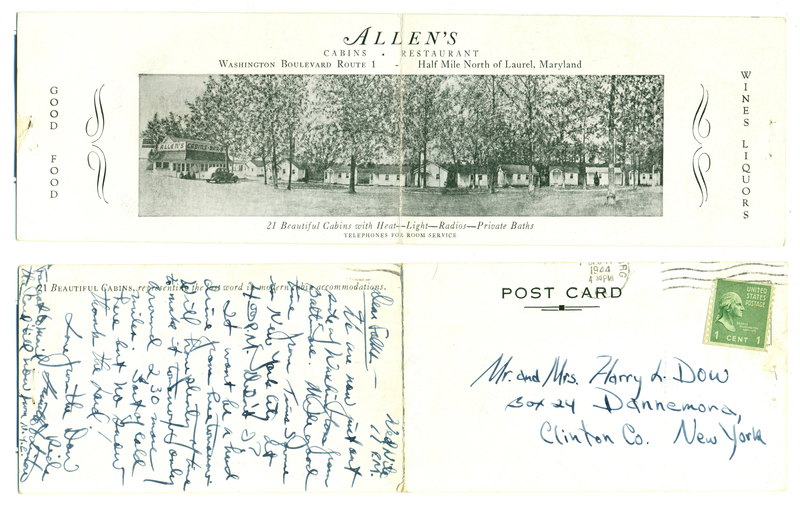 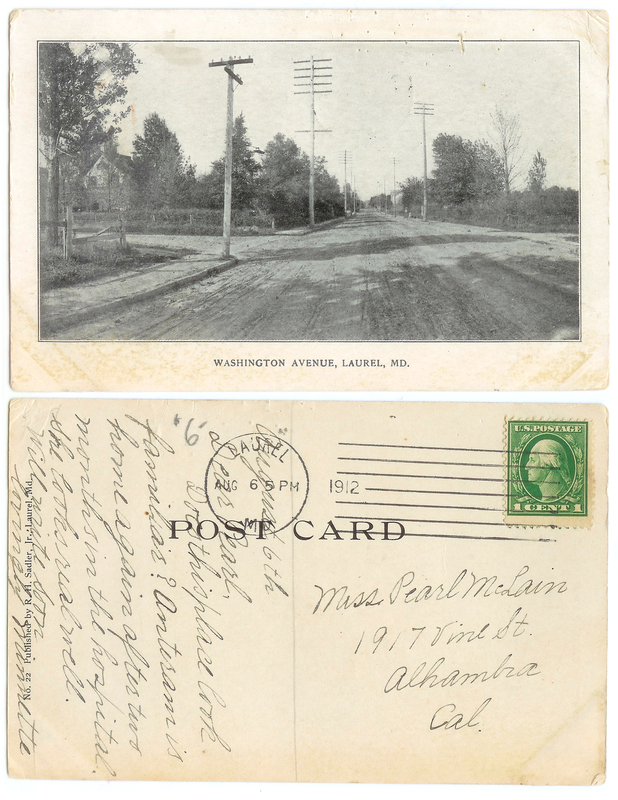 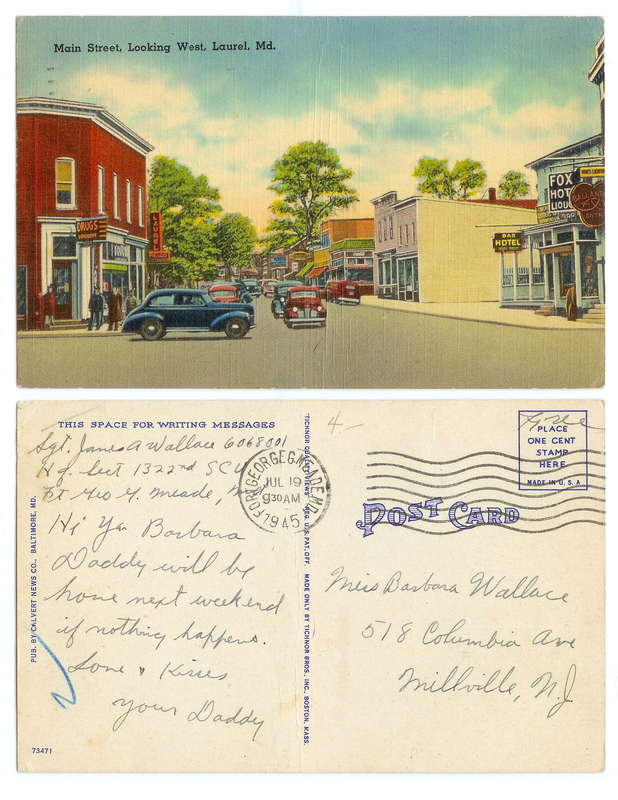 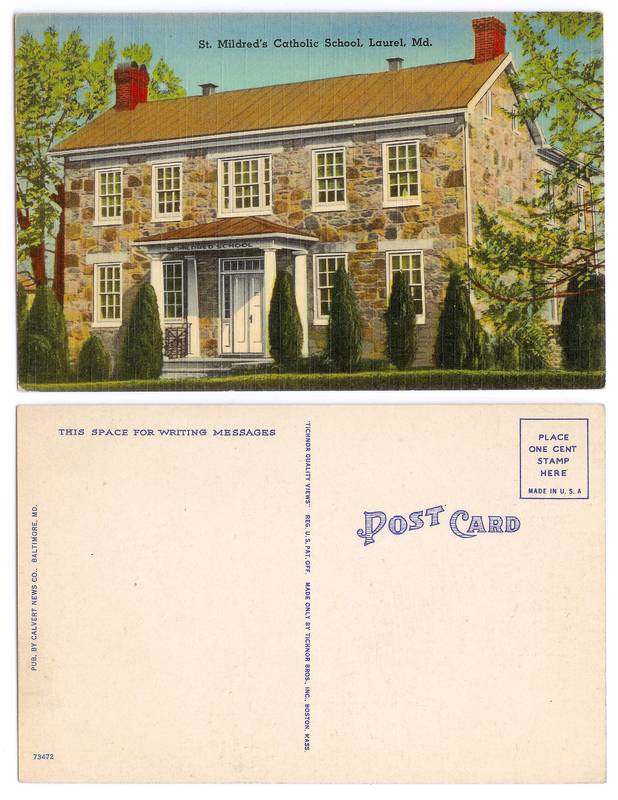 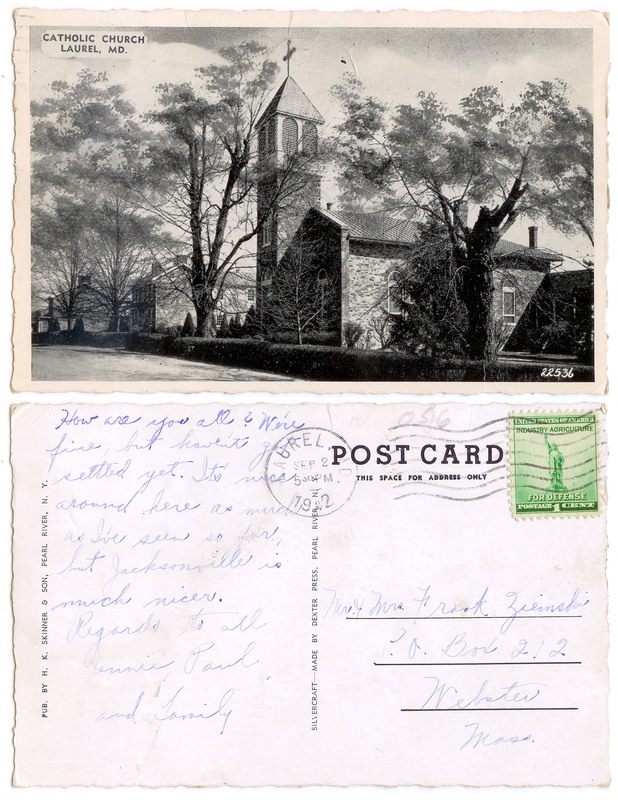 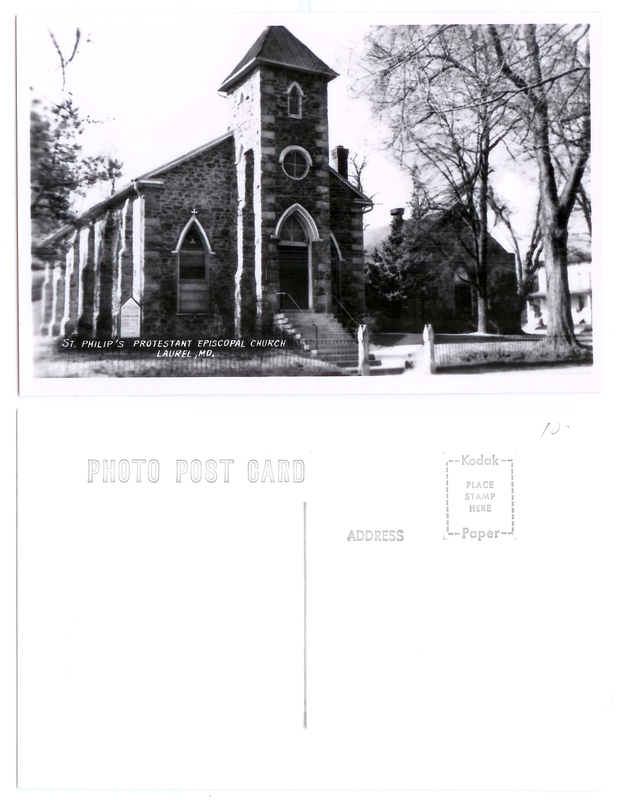 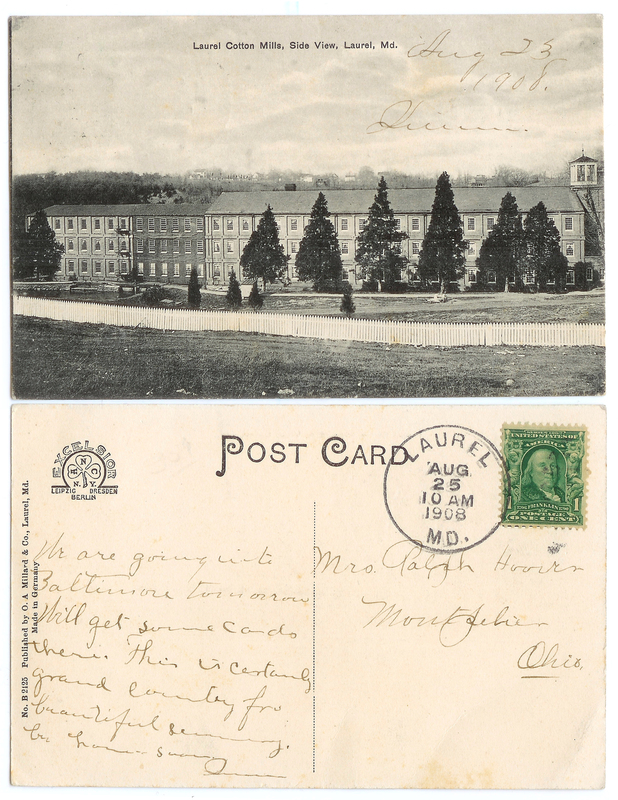 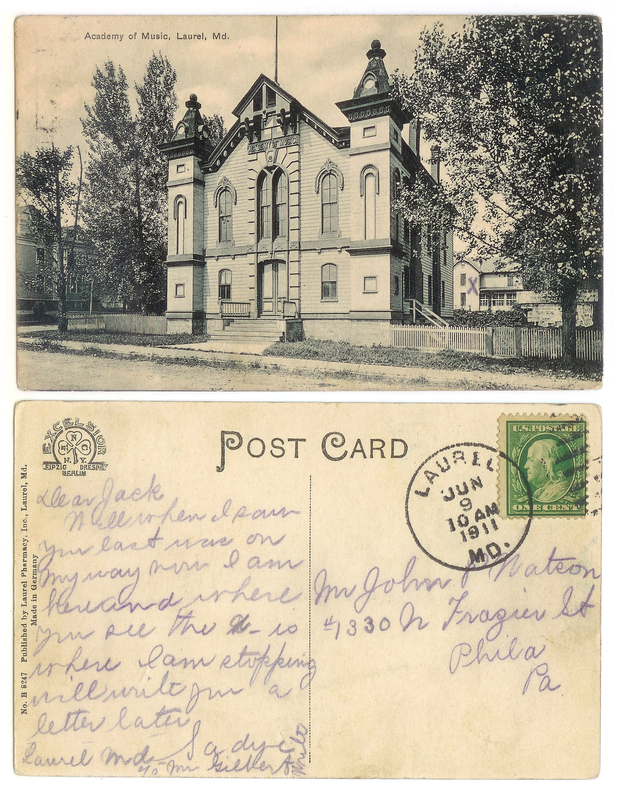 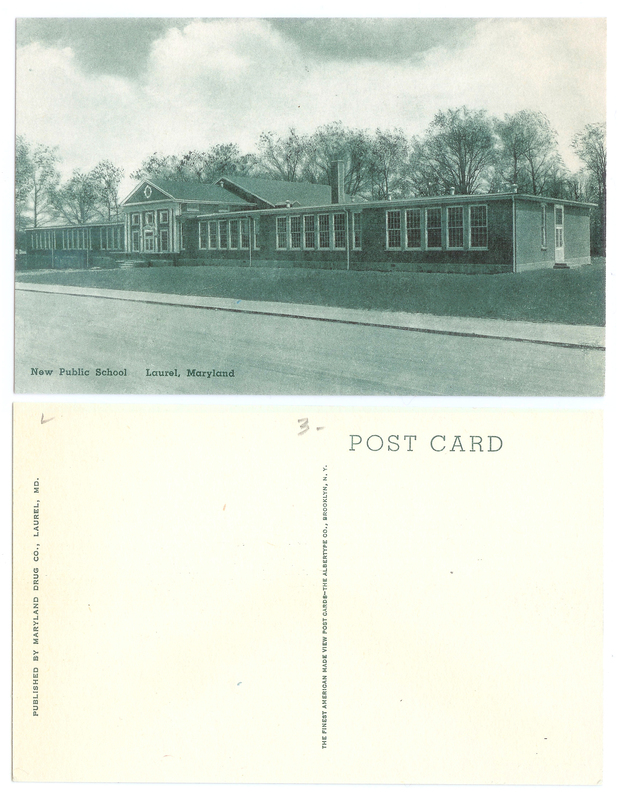 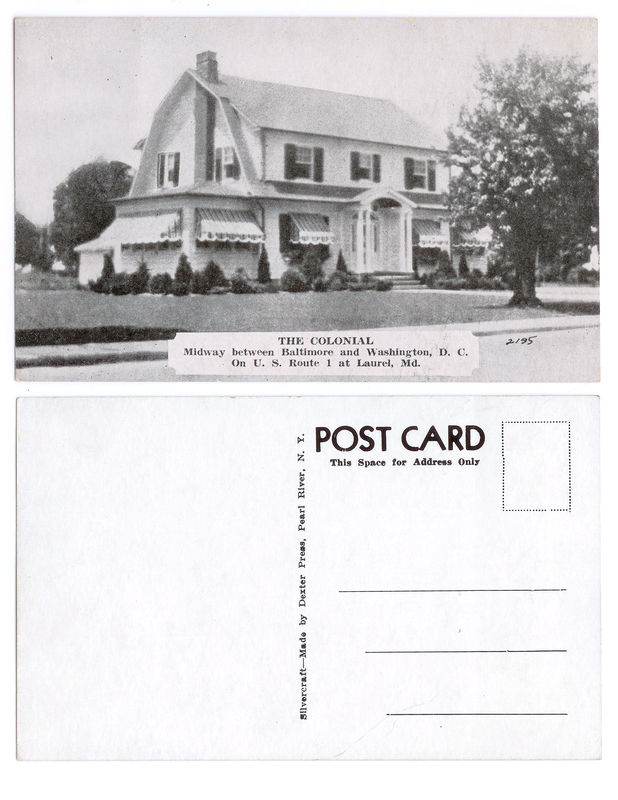 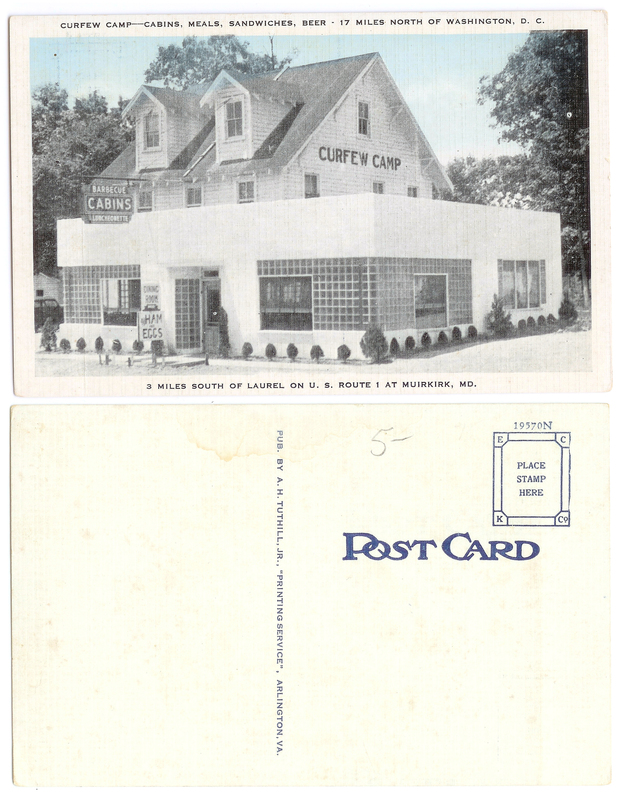 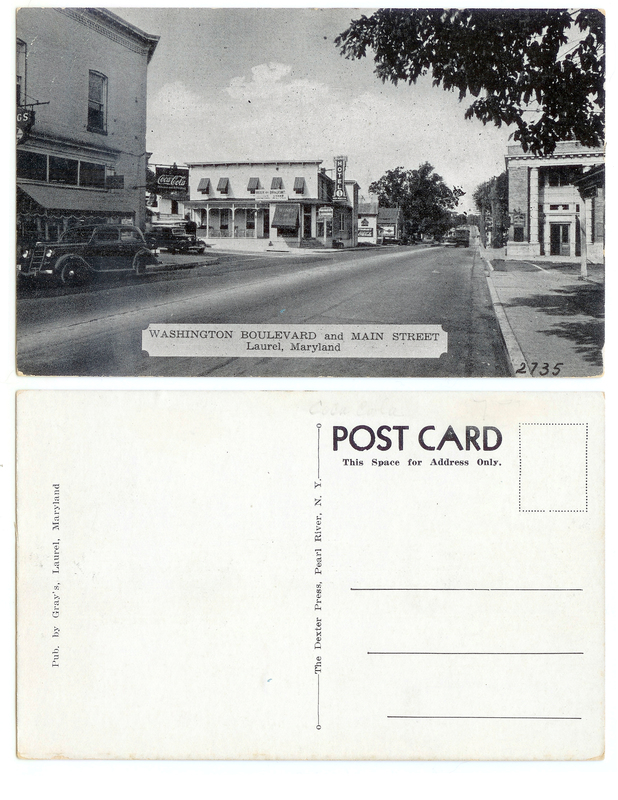 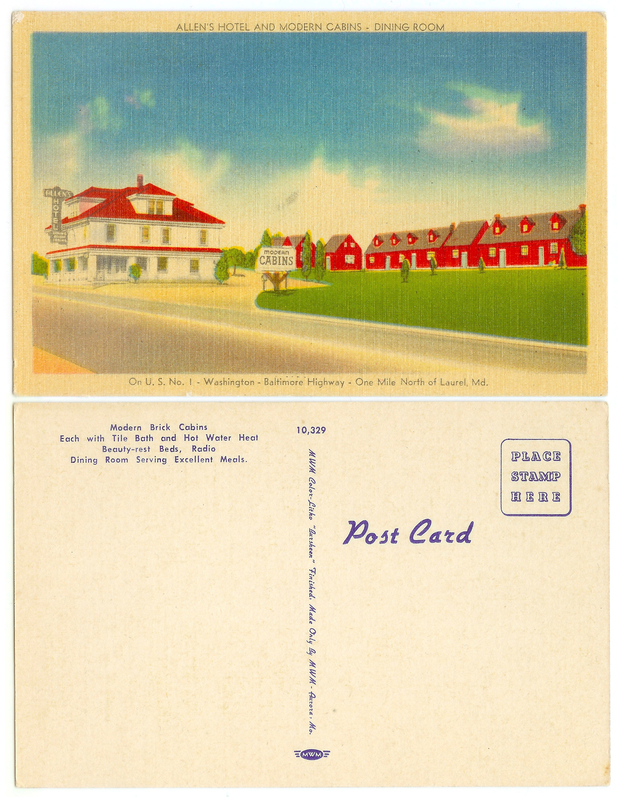 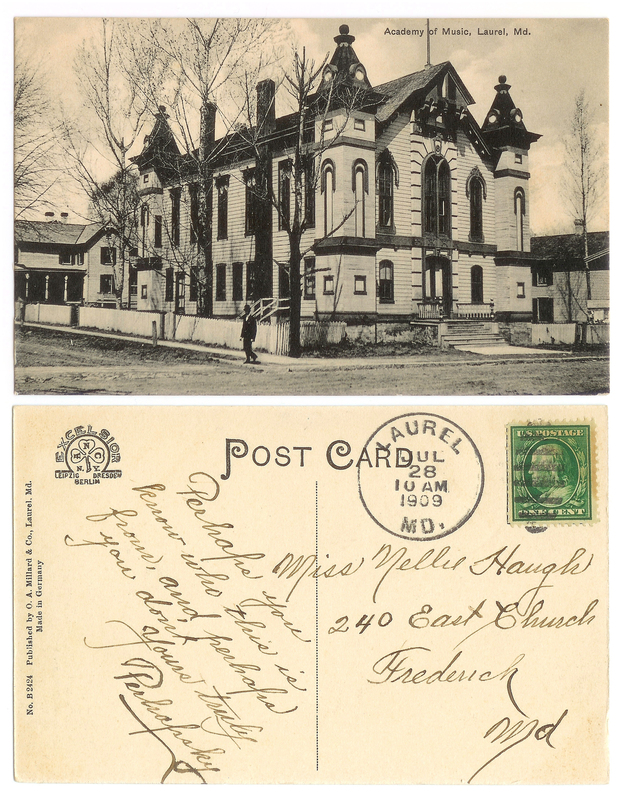 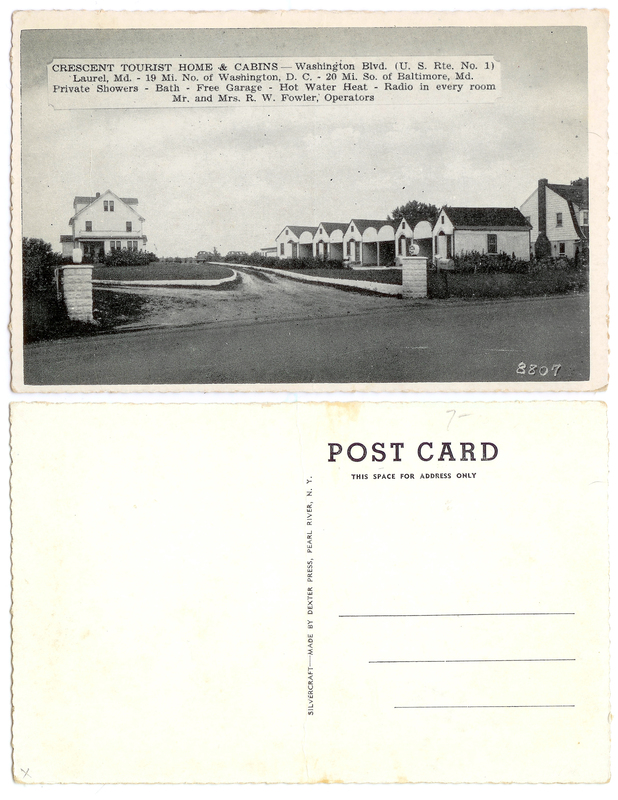 But what if I told you that there have likely been well over 100 picture postcards of Laurel, Maryland produced since the early 1900s? 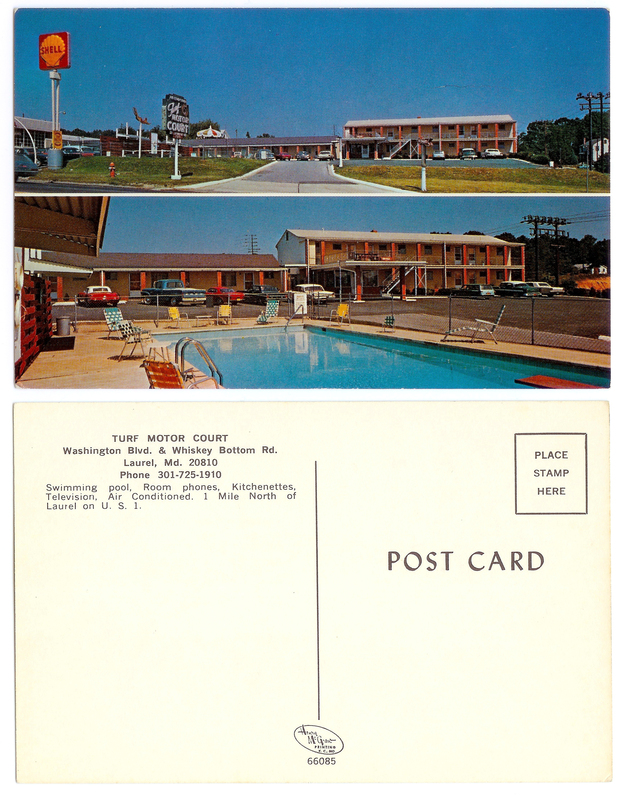 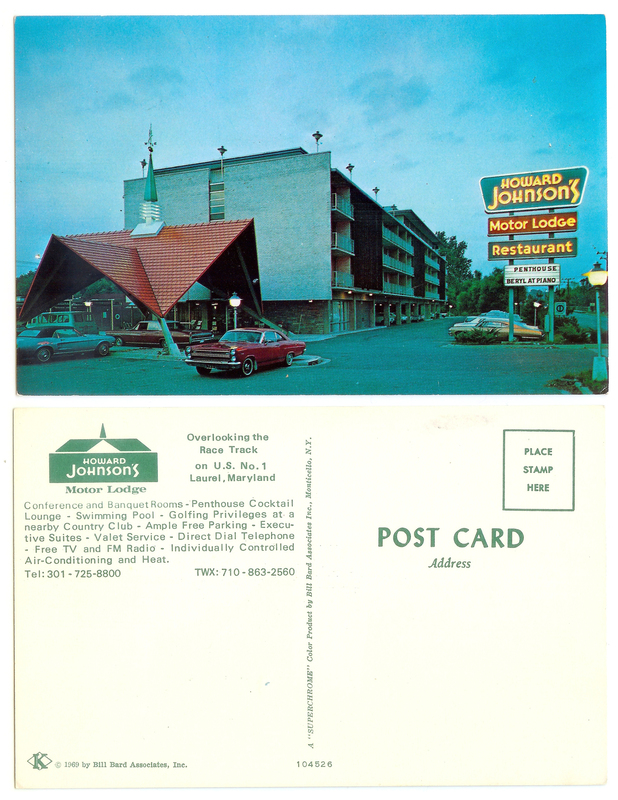 Many of them featuring motels, restaurants, and street scenes that have long-since disappeared… and a few that actually still exist today. 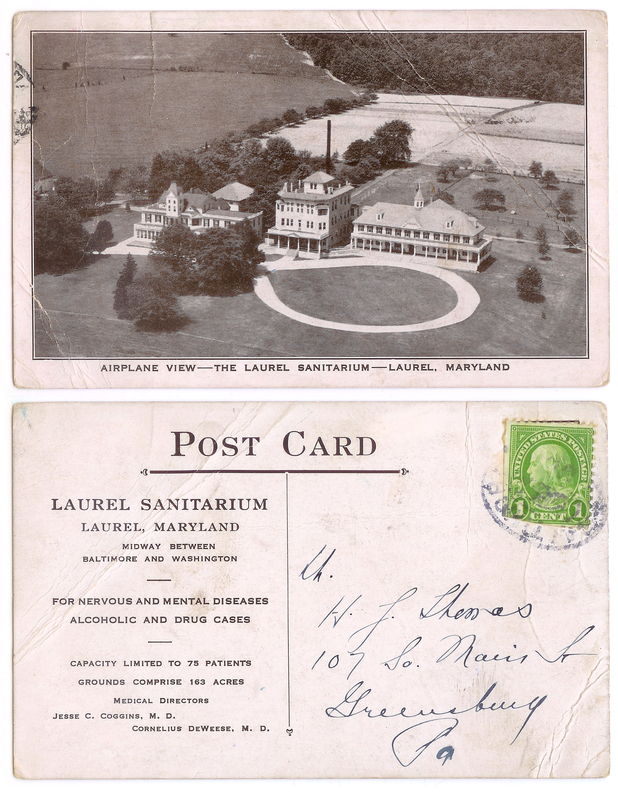 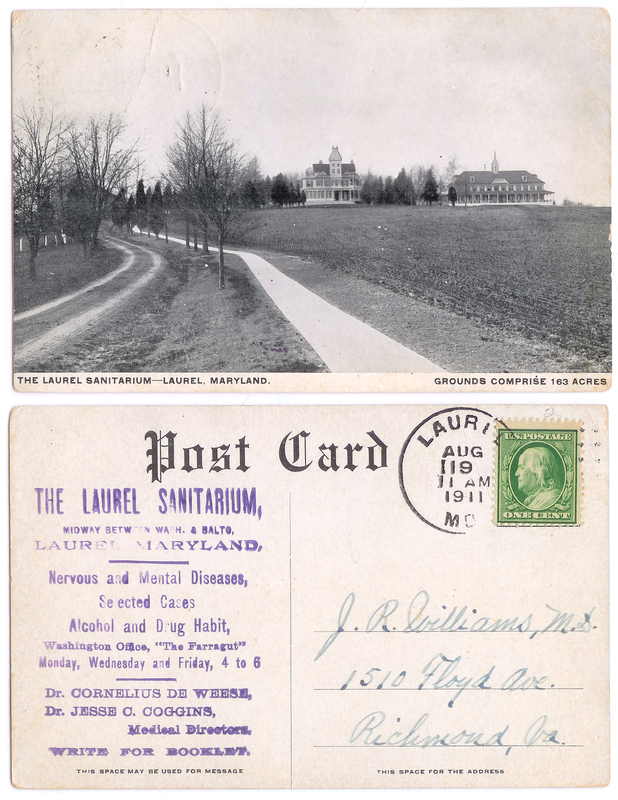 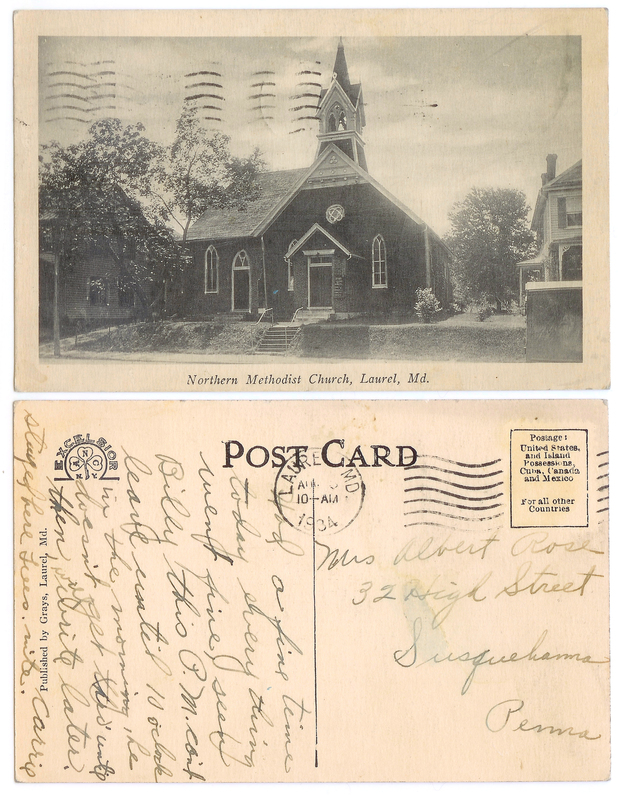 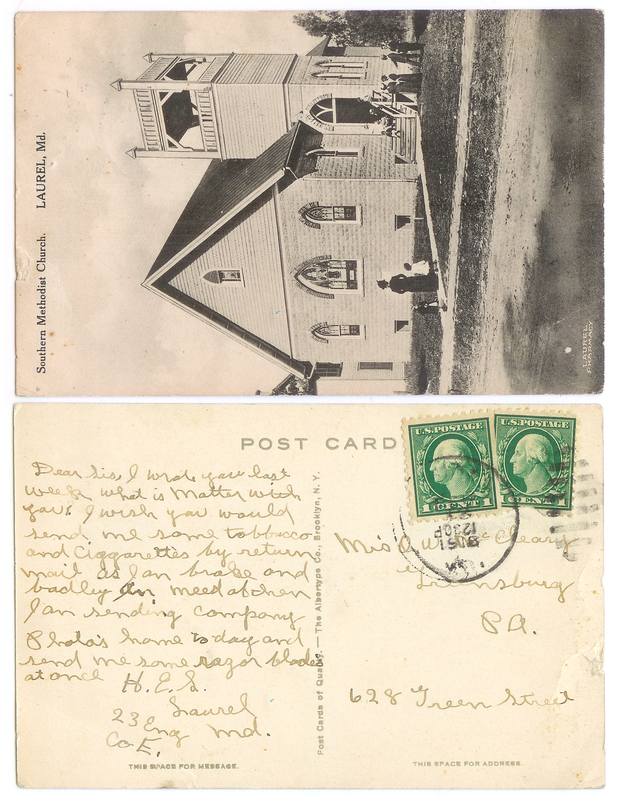 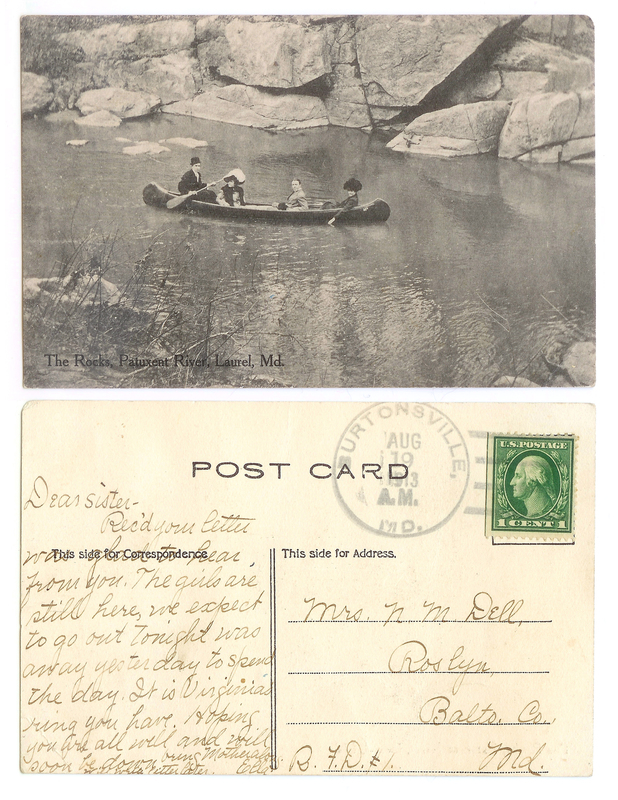 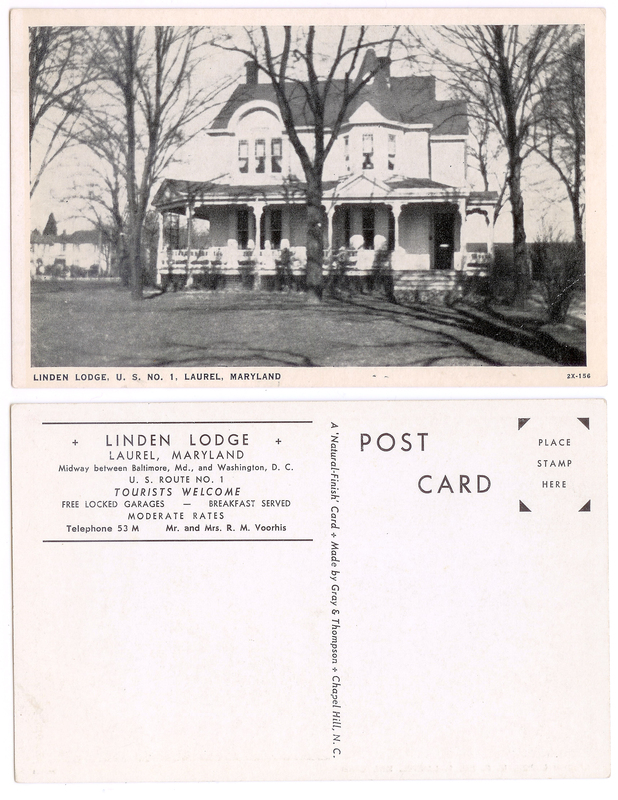 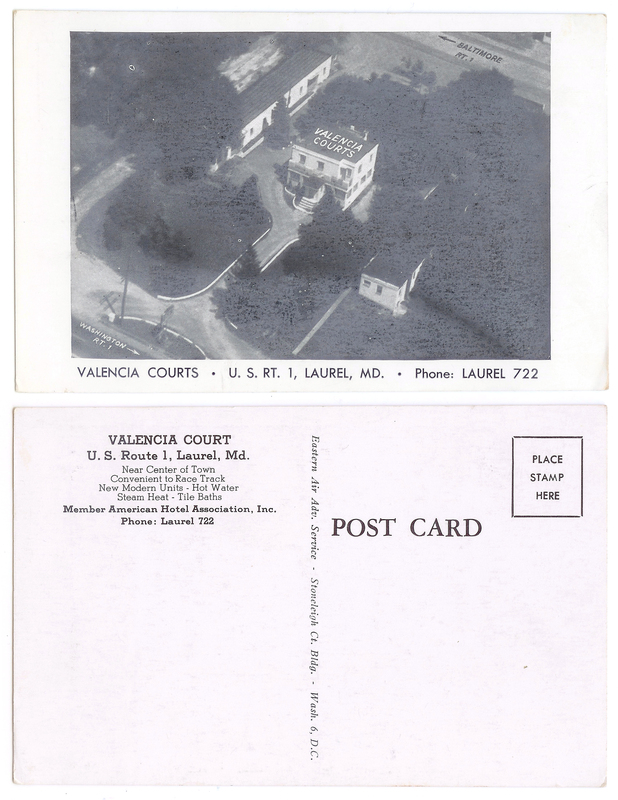 John Floyd II has amassed a tremendous collection of original Laurel postcards over the course of several years, and was kind enough to lend me his entire album to be scanned and shared. 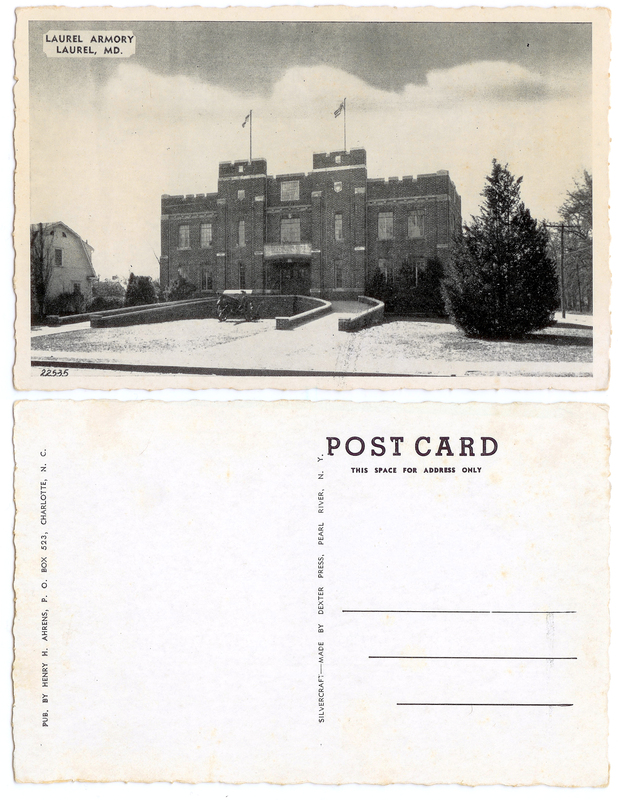 Here now are over 80 cards, front and back. 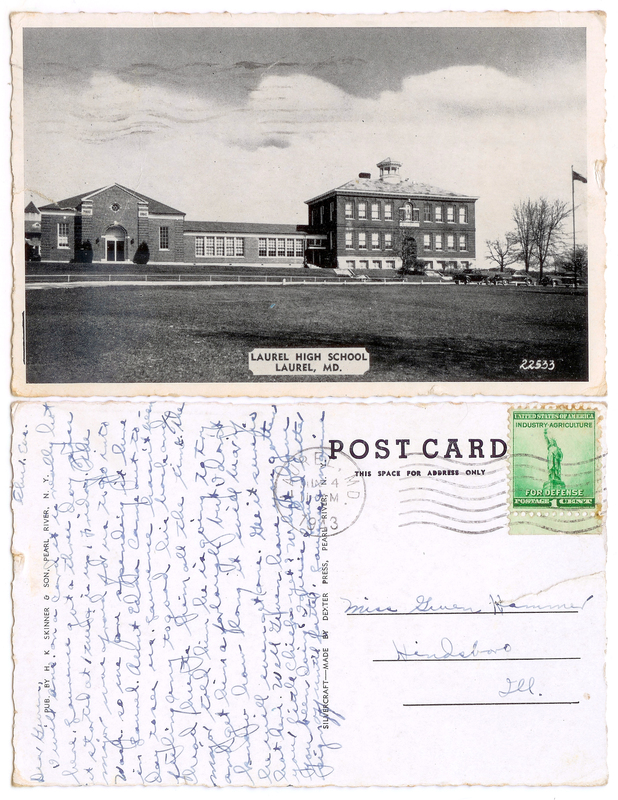 Some bear interesting correspondence and postmarks, others are as blank as they were the day they were first purchased—undoubtedly in Laurel.